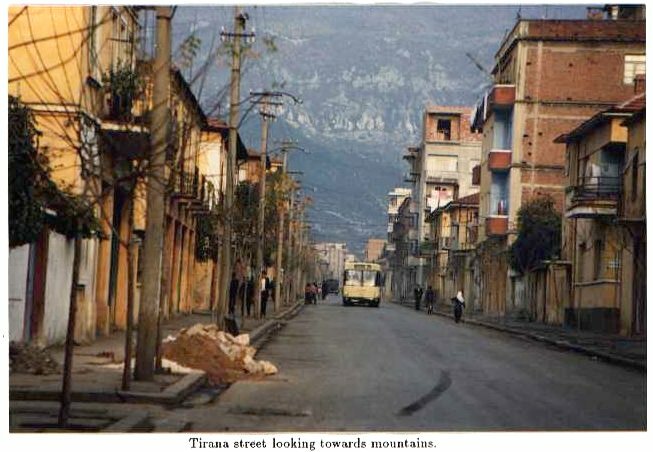 History has proved more than once that whoever has marched to Tirana has laid their bones there. 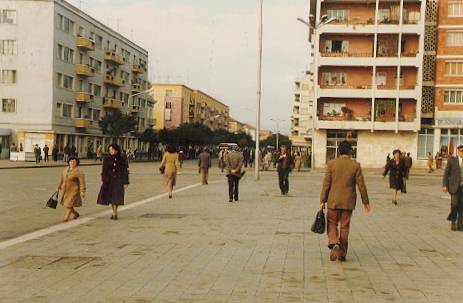 Zeri i Popullit, Tirana, October 14th 1988. 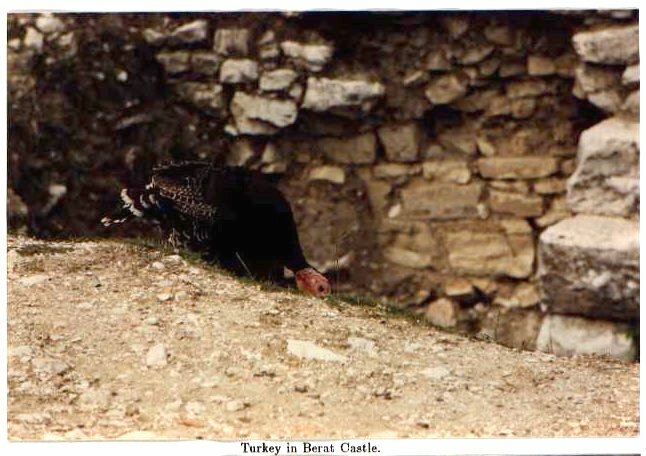 All photographs, text and artwork in the Albania Travelogue are Copyright 1987-1997 by Colin Seymour unless specifically attributed. Update Dec 30 2006: Re-posted with many new images. 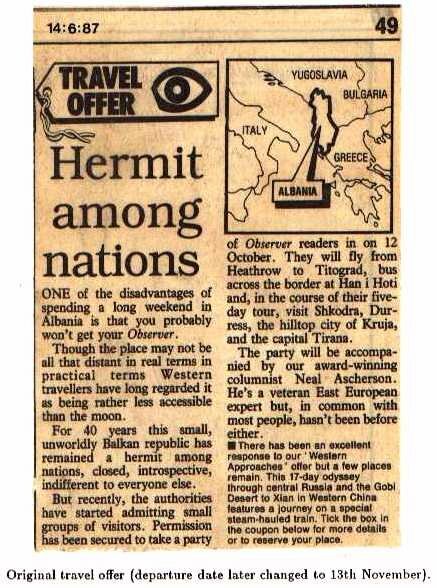 The title Albania- hermit among nations introduced a special travel offer in The Observer, a UK newspaper, to take a party of readers (including yours truly) in to Albania in November 1987, flying from Heathrow to Titograd and bussing across the border at Han i Hotit. This was a unique opportunity to visit an out of the ordinary country, isolated from the world by a Stalinist regime, visited by few foreigners. 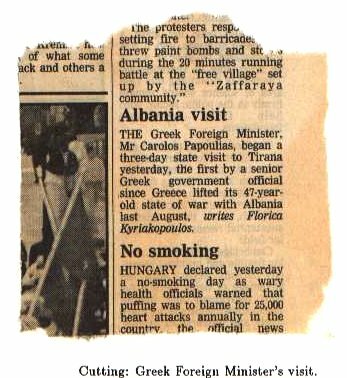 Radio Tirana has been notorious for interference to the 40m amateur radio band, putting out a very strong signal carrying state propaganda; somehow this added to the curiosity value of a visit to the country. Detailed map showing northern Albania and Tirana, down to Berat. 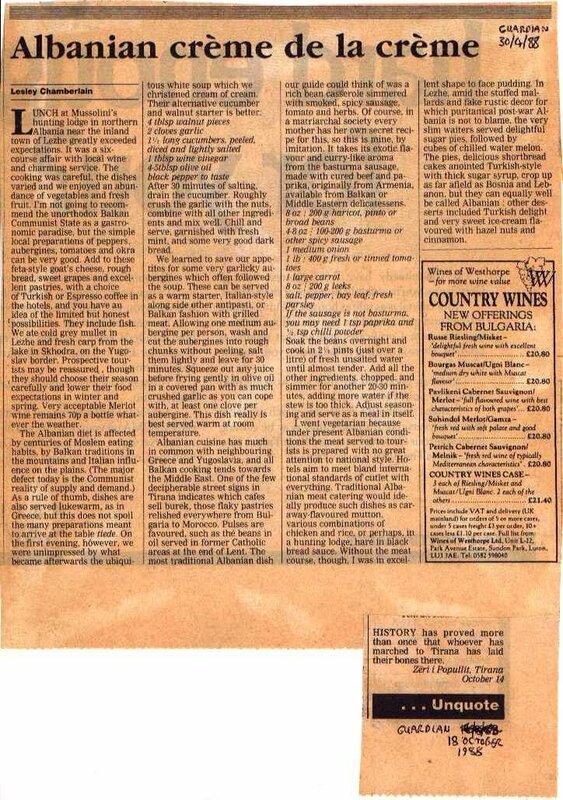 Originally written in 1987 after the trip (in LaTeX on a DEC MicroVax) this account has a particular fascination now as it can be seen to have occurred on the cusp of a fundamental change, during a time of increasing openness to foreigners, and in the light of contemporary events that are once again discouraging foreign travel to the area [that was written in 1997; in 2006 Albania signed a Stabilization and Association Agreement with the EU, completing the first major step towards joining the EU, see the Wikipedia link at the foot of the page for more details]. It should be remembered that the trip was managed throughout by the state travel bureau, Albturist, who obviously would wish to present things in the best possible light. 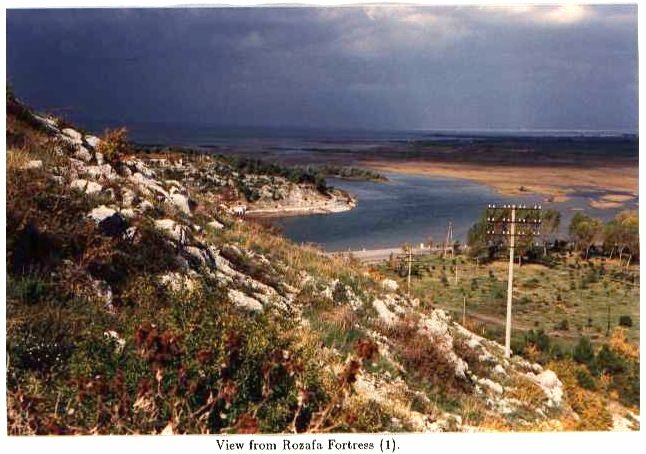 Our first sight of Albania came from the Yugoslavian border post under cover of darkness. We had assembled for a lengthy process of passport-checking by intimidating border police. Later the tour guides, Valeria and Bridget, from the Jules Verne travel company, told us that practically every other word had been "biro", but despite not being so obliged our passport check was finally completed and our names were called out in groups of four. 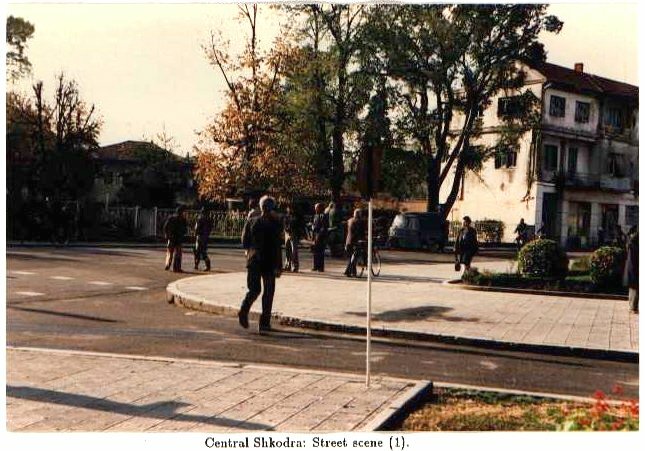 The first two set off across the no-mans-land from the Yugoslav post towards the dim outline of the Albanian post and gradually we assembled by the entry gate. Then, more passport inspections, according to our group visa lists in small groups, this time walking over to the Albanian Customs building. 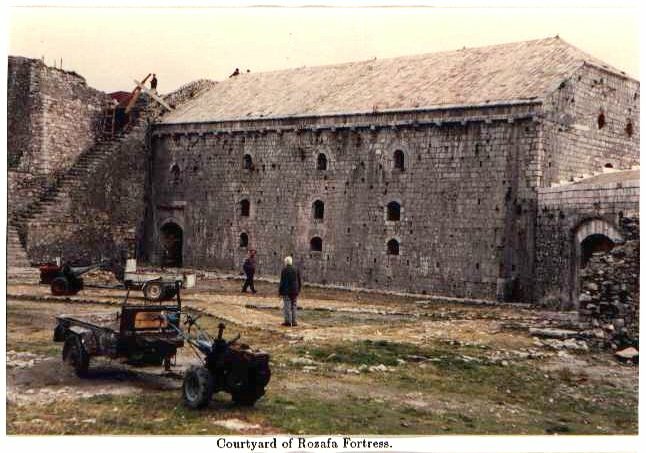 This building was still in the process of being built, perhaps anticipating a growth in tourism. 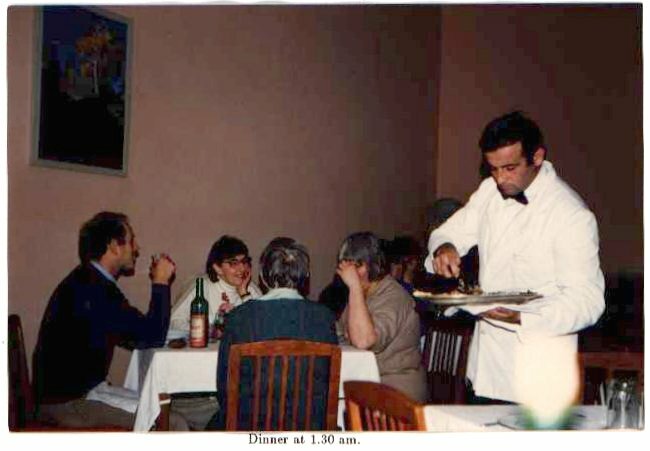 It had been fitted out with armchairs, tables and a bust of Enver Hoxha. Its spartan nature was to be seen later as a clue to the general condition of the country. The customs process consisted of filling out forms with names, addresses and writing down anything matching a list of items such as radio receivers, camera recorders, printed matter, and refrigerators, which must be declared. "Smuggling" it read, "is punished according to the law". Later, the customs official picked those people who had declared radios and cameras, carefully checking those items. Passing the small wooden table we stepped outside and circled back to the entrance of the waiting room. A sign to steps leading up read KAFE, a promise for future travellers. Eventually our Albturist buses arrived and we met for the first time our local guides Ilii and Leda, and the driver Moli. 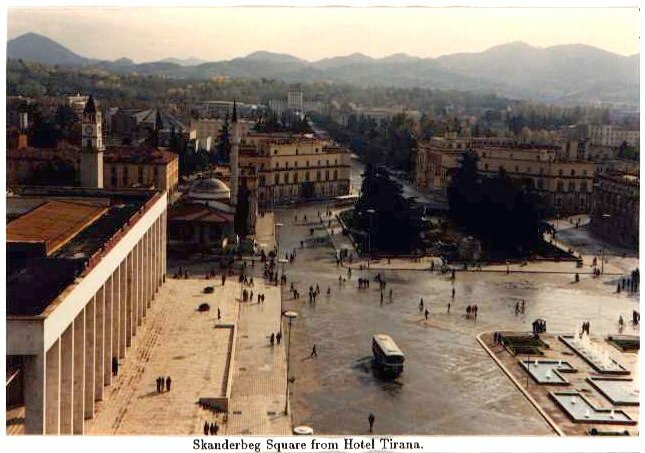 The journey from London Heathrow was rather involved, consisting of a flight to Belgrade with a stop at Zagreb, where we passed through immigration to Yugoslavia to take the internal flight to Titograd. Jugoslovenski Aerotransport coaches took us to the border post. 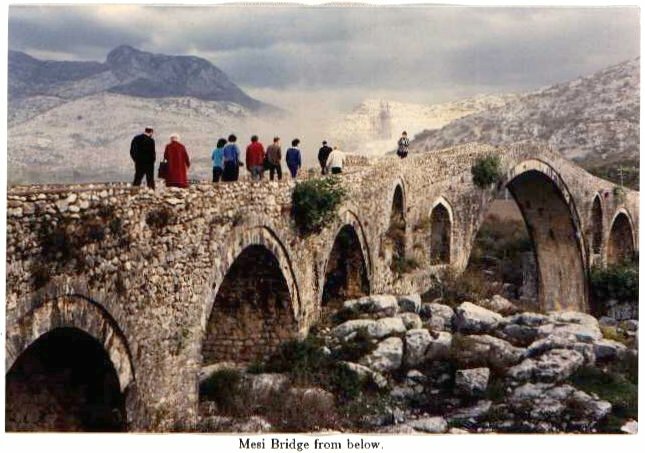 No citizens of the US or the former USSR were allowed into Albania, so our group were mostly English, plus 1 Australian, 2 New Zealanders, 1 Canadian, 1 French and 1 Irish person. At Belgrade the non-British citizens unexpectedly had to queue up for transit visas. The New Zealanders had to pay for their visas, but not the Australian (because there are more Yugoslavians in Australia?). 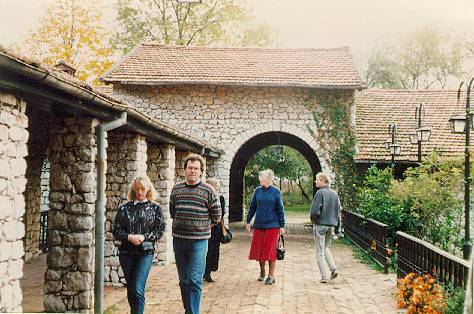 The Jules Verne tour guides vanished and we had to ask a Belgrade Airport policeman the way. At the border post our crossing over somewhat resembled crossing Checkpoint Charlie- yet this was a crossing from East to East. Apart from the border building the drive from the border into Albania revealed little at first, but the first of many political slogans. 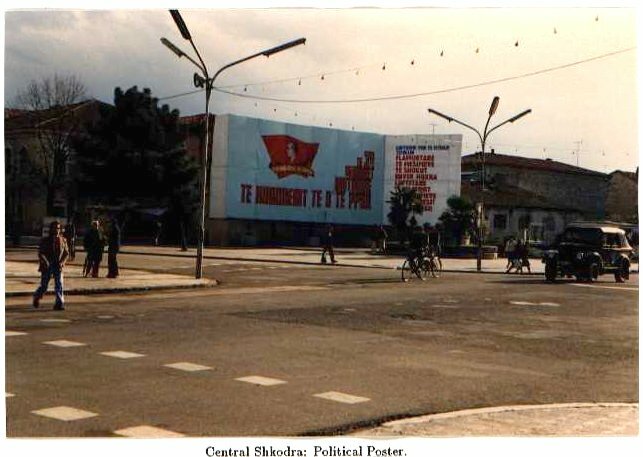 There was no advertising as we know it in Albania, at that time it followed its own brand of extreme Stalinist communism, with political quotations abounding in shops, on roadside signs and on every conceivable surface and building. 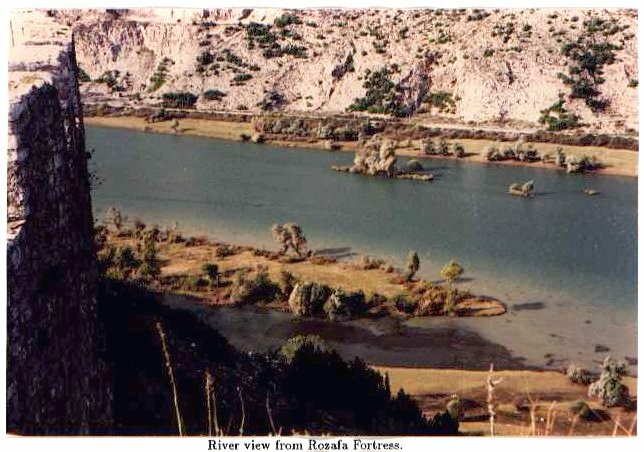 One could not fail to notice the name of Enver Hoxha, and his successor Ramiz Alia. In our coaches and on visits, we were continually lectured about the agriculture, industry, society and history of the country. Our guide pointed out that were it not for the pitch darkness, on our left we would see mountains, and on our right the lake of Skoder, which is one of the lakes on the borders which are half owned by Albania and half by its neighbour country (former Yugoslavia). The hour or so's drive got us to Shkodra to have a very late dinner in the Albturist hotel. Checking in, we handed over passports in exchange for the key. We were prepared by the Jules Verne information pack to expect spartan and simple accomodation. Double rooms with two single beds are the norm and singles must room with each other. There is no hot water in the morning (once, no water at all in the taps) and the ensuite bathrooms look rather unsanitary with damp and mould patches on the walls. 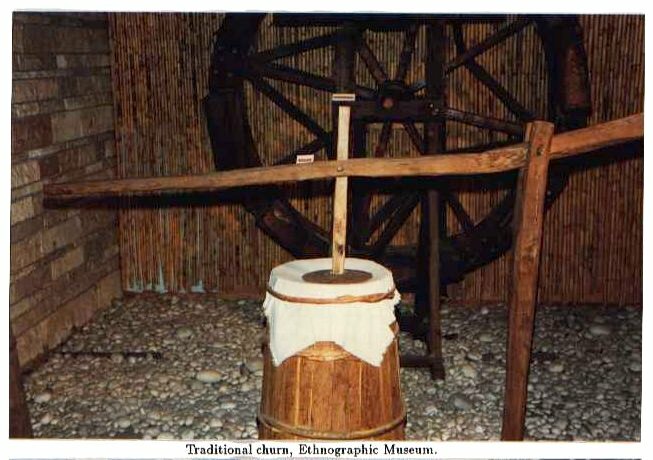 It is the norm for some item such as the loo seat to be missing or for the loo not to flush- the "Guide-book to Albanian" thoughtfully provided the phrase "The toilet won't flush". And this was some of the best hotel accommodation in the country. When dealing with Albanians, you have to remember that the shake of the head means "yes" and a nod means "no", so actually it is better to avoid such gestures altogether to prevent confusion; or learn "po" for "yes" and "jo" for no (o as in port, j as y in you). Our guide admitted that the main purpose of the Albturist tours was political, to introduce interested persons to the country and gain support and trading links. 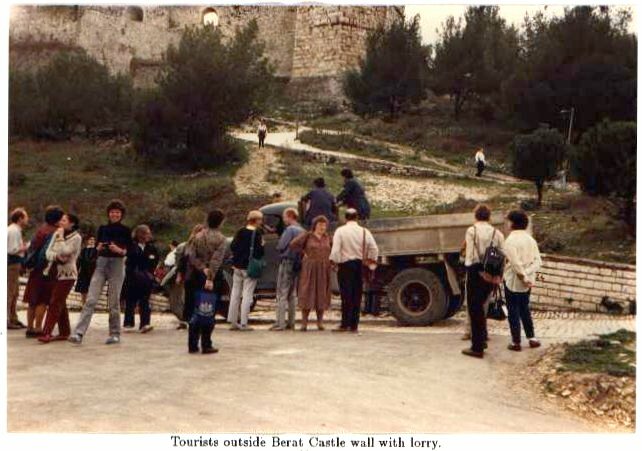 They limited tourism because they took the view that it spoils a country. 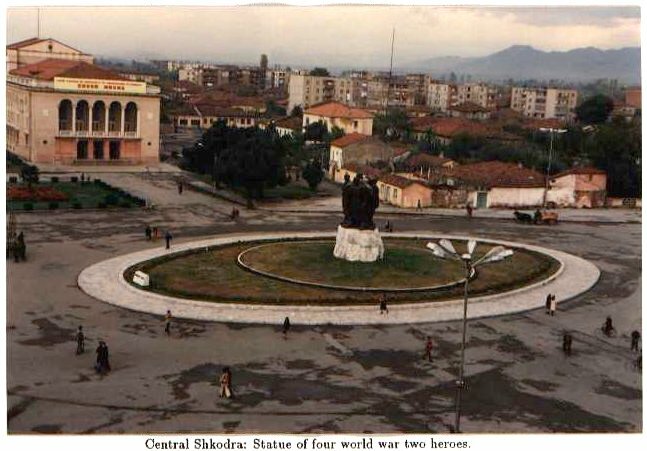 After arriving in Shkodra in darkness, it is something of a shock to look out of your hotel window onto the main square of the town in the light, and see the stark grey buildings topped by party slogans in red and people making their way to work on foot and by bicycle. 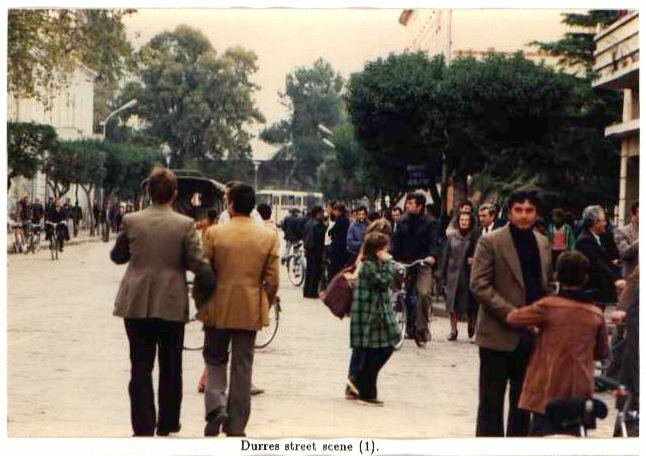 Occasionally a covered motor tricycle traversed the square, or a bulbous battered truck. 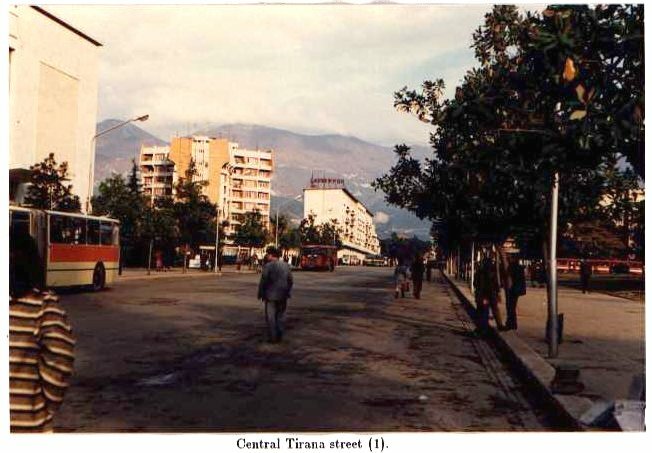 There were hardly any cars in Albania. Cyclists were numerous on all the roads. Often a girl sits side-saddle on the back, but men were also commonly seen taking lifts in this way. Breakfast was a basic meal of dry bread, hard boiled egg, and either cheese (like feta) or possibly 3 slices of salami, with tea (no milk). There was an apparent shortage of cows so the cheese was made with sheeps milk. 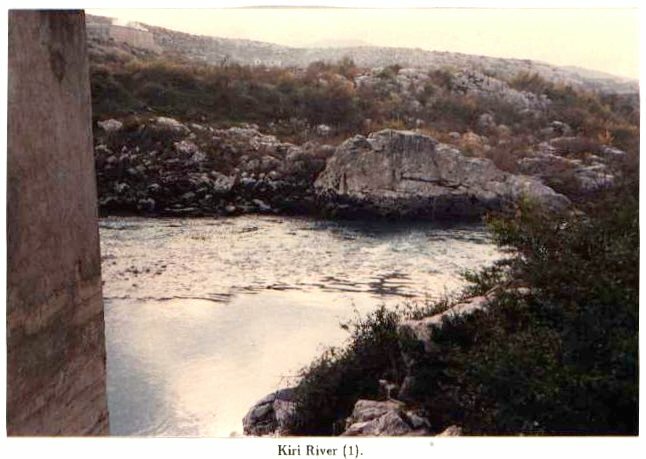 Albanian agriculture started breeding from French Frisian cows to improve the milk and meat yield over the native animals. Lunch, the main meal, starts with a soup, which can be good depending on tastes, an entree (e.g. Trout), with the ubiquitous dry bread, followed by typically a piece of meat with three vegetables. An excellent shish kebab was served in Tirana. Then cake or eclairs, then a bowl of apples, mandarins or grapes. Cream was substituted in the cakes by a sugary-apple sauce. Meals usually had a varied side salad. Not much pest control appeared to be in use, judging from the worm holes in the apples, but the fruit was still particularly delicious. Dinner was similar to lunch, but without the entree (just soup) or cake, and a little smaller. In the morning we changed GBP 10 each, as advised, to Lek. This 112 Lek (or so) was sufficient for all additional wine, beer and spirits throughout the four full days in Albania, plus souvenirs bought in local shops (sweets, biscuits, Turkish delight). 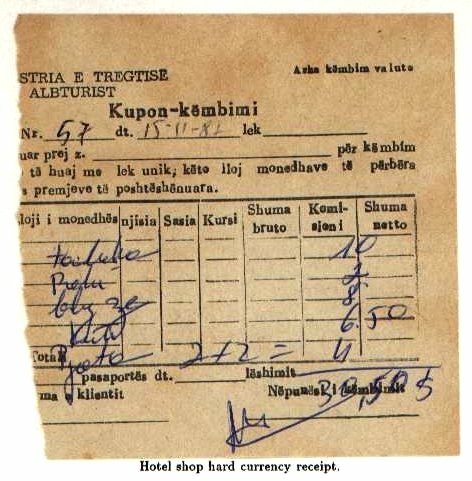 Otherwise souvenirs were bought in the hard currency shops in the hotels (or nearby in central Tirana), and in these you get a select range at generally similar prices to those in the street shops (you must compare to get the best price between hard currency shops and local ones). The range of goods is extremely limited in the town shops, for example there were only about half a dozen types of confectionery. I failed to spot any butcher's shops. Most shops are very similar with simple signs above, and a counter at the back of the shop where you ask the assistant for your requirement. It was easy to get the impression going past in the coach that the shops are virtually empty of goods, but this is partly due to the large empty space between the window and counter, and the low-key display of goods. There are few varieties of goods, and very basic but there seems to be a continuity of supply of most of them. 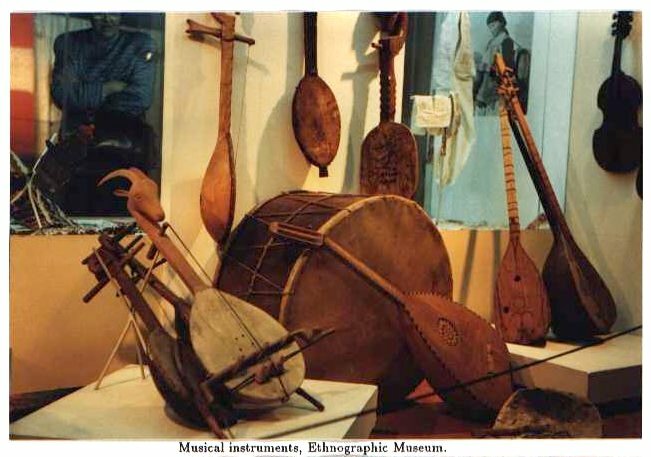 The "Kinkaleri" shops, meaning "different small items" are most interesting in the varying selection of bike parts, haberdashery supplies, houseware, writing instruments or even valves for the common large valve radios and amplifiers. Odd things like the glass insides of Thermos flasks were seen, and for maths, students have a selection of slide rules. 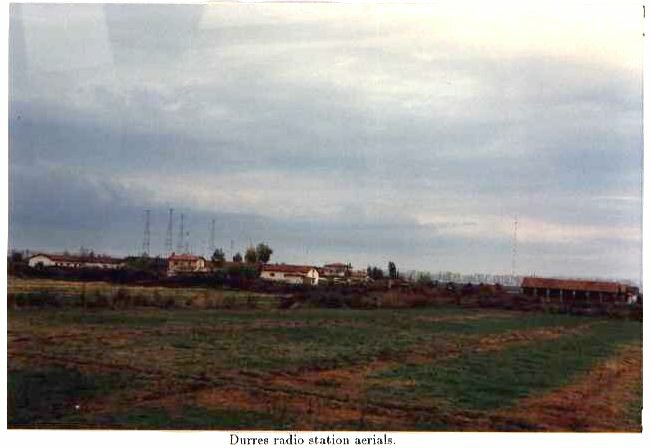 Albanian towns were well covered in TV and radio aerials for the televisions and radios which seem to be quite widespread. As far as machines and electronic goods are concerned, it is likely that the more sophisticated are imported and re-labelled, often being maintained by locally produced spare parts. 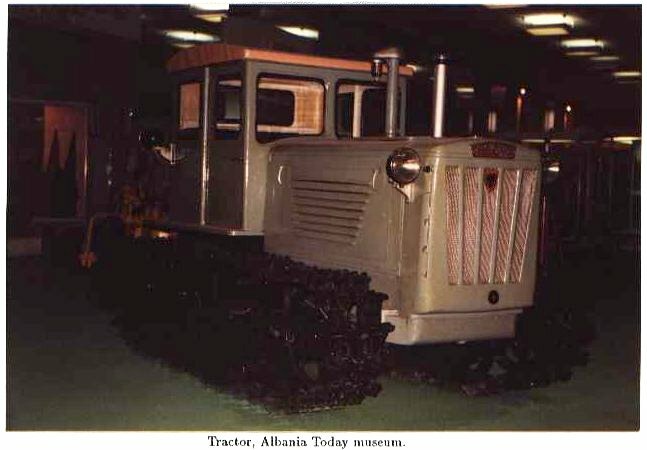 Albanian vehicles were produced but many old diesel vehicles from the People's republic of China were still in use. We looked in at a watch repairers shop, where behind the screen an old man was working on clocks and watches that would rarely be seen in junk shops in Britain. Perhaps one of the few digital clocks in the country is the big one over the State Bank of Albania in Tirana. "Make do and mend" is common; one of our group related the tale of a shop where holes in plastic buckets are repaired by a man with a hot iron, melting and joining the plastic. Plastic goods are produced by the country's developing petrochemical industry, and can be seen in shops. 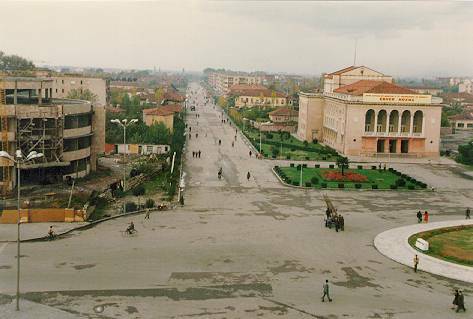 But perhaps due to the low national wage (said to be kept within a 2:1 ratio of 500 to 1000 Lek a month) and the thrifty nature of Albanians, all kinds of goods are kept functioning as long as possible, if at all repairable. Another example was a motorbike windshield which was apparently broken at some time and had all the pieces glued back together like crazy paving. 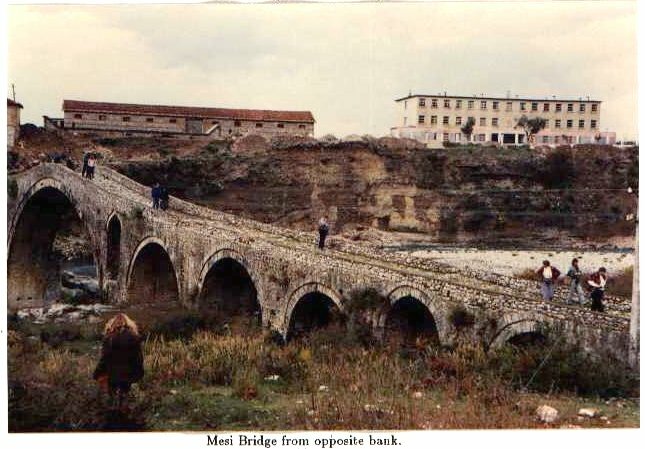 At Shkodra we departed for a look at the mediaeval Mesi Bridge, which stands over the Kiri river. 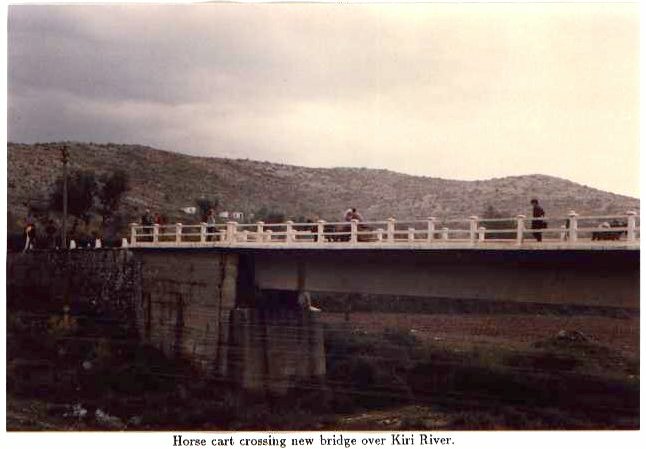 It stands by the side of a modern road bridge yet the traffic on the modern bridge was strangely mediaeval consisting of horses and carts, ox carts and donkeys laden with bales of straw. Driving through the rural areas was a trip back in time as the coach beeps to get round the horse carts and peasants carrying farm produce on their heads or on donkeys. Driving everywhere, on the Albturist coaches which are one of the fastest things on the roads, required a great deal of horn beeping and manouevring past grimy diesel trucks. People got about in articulated buses, with a concertina in the middle. These were in stark contrast to our tourist coaches, often filthy and with many windows missing. Several times we passed a crowd of people accompanying a broken-down bus in a remote lane. 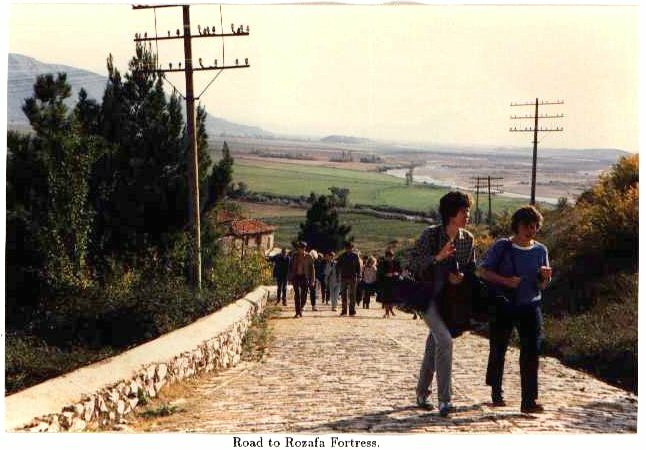 There were few roads; to get to Tirana from the North for example, required a right angle drive nearly to Durres on the coast and then a turn East towards the capital. The mountain roads (76% of the country is mountainous) were reputed to be very difficult. 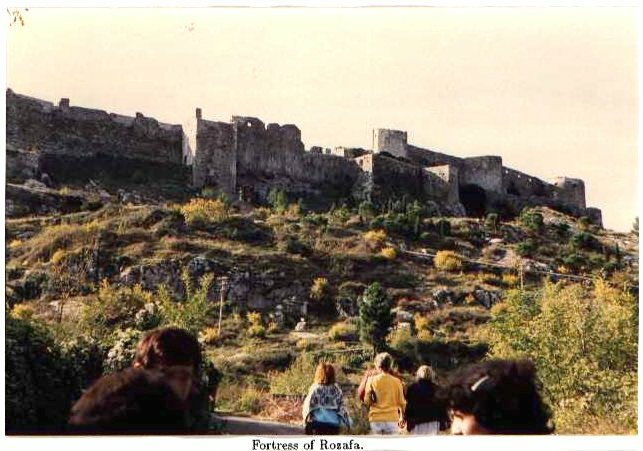 We reached the fortress of Rozafa just outside Shkodra, a ruined castle supposedly of 300 BC, and rebuilt by "feudal lords". 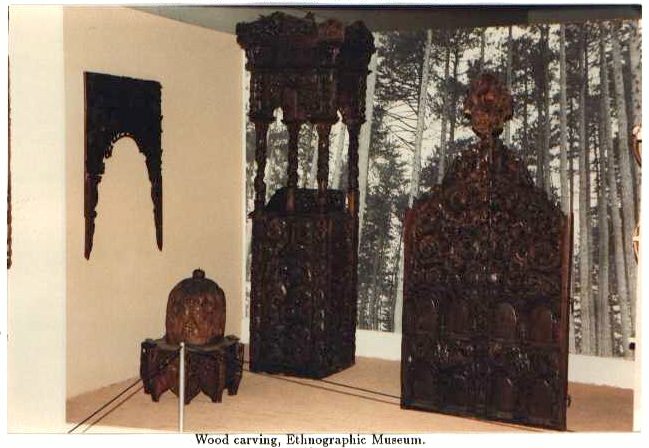 Men were working at the ruin reconstructing wooden carvings and rooms. 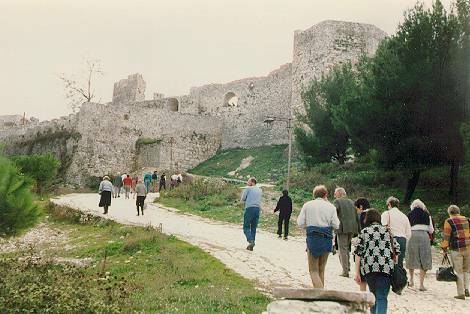 Surmounting the castle was a slogan in huge red painted metalwork: "RROFTE ME SHOKUN RAMIZ ALIA", which one could inspect at very close range by walking on the castle wall. 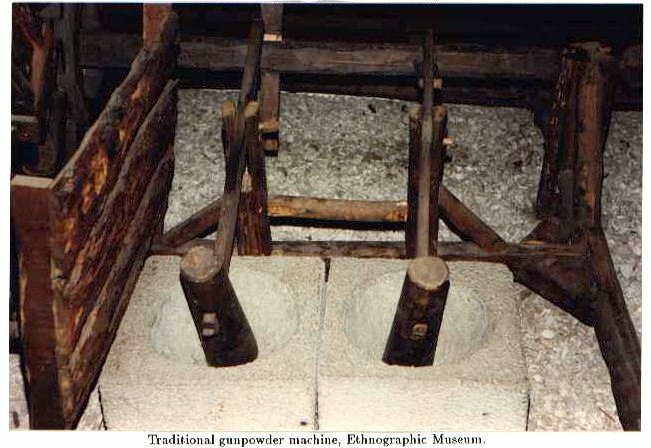 Much was packed into the short tour, and our guides kept to a strict plan, but sometimes liable to ad-hoc rearrangements. 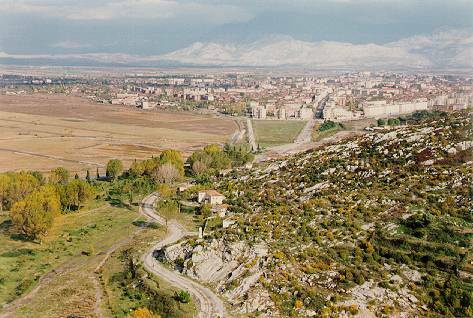 From Rozafa we moved on to Lezhe, the location of the tomb of Skanderbeg, who is the national hero of Albania. Unfortunately the person in charge of the key in the town could not be found, so we were unable to look inside the tomb's walls except through a crack. Apparently, museums were normally kept closed until a group of tourists or schoolchildren visited; they were not open to the general public. Lacking admission to the tomb, I walked up to a block of flats. Piles of firewood were stored on the balconies for the coming winter and also strings of onions. Blocks of flats tended to look much the same everywhere and usually tatty. Flat rooves are common (with attendant rain leakage problems). In some areas, broken windows often stay unrepaired. If our hotels are any guide, the flats must suffer badly from damp penetration. 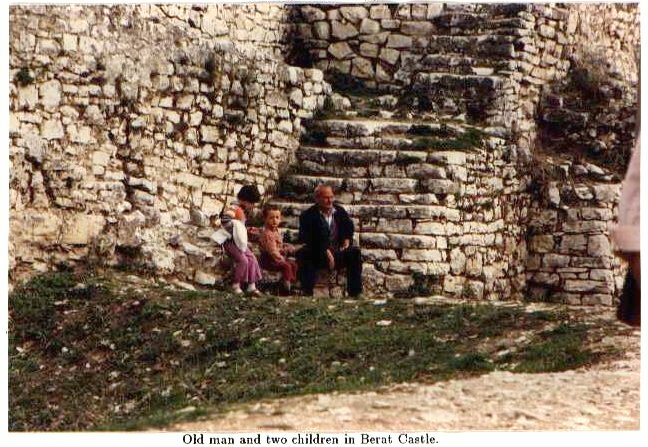 We were told that it is possible to own property, which our Albanian guide does, but the prices of houses are set by a jury of local people and a government official to prevent property speculation. 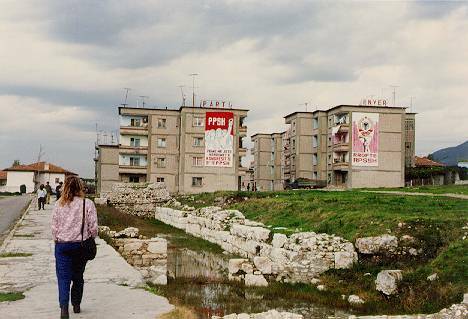 We heard that Gypsies in Albania had been placed in apartment blocks by the government, but to no avail: they invariably moved on after a few weeks. We lunched at what is called the "Hunting Lodge", near Lezhe, which functions as a tourist restaurant. 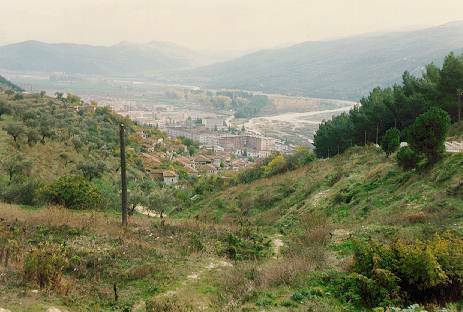 At one time it was used by Mussolini during a period of occupation. 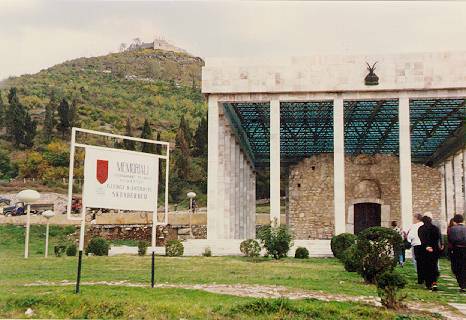 We returned to the coach again for an hour long trip to the citadel town of Kruzhe in which is built the Skanderbeg History Museum, Skanderbeg being given high regard for repelling the Turks at Kruzhe in the 15th century while heavily outnumbered. The goat's head emblem, and Skanderbeg's helm with a goat's head on top were explained by this legend: Skanderbeg, his troops under attack by a superior force, tied hay to goat's horns and set them alight. 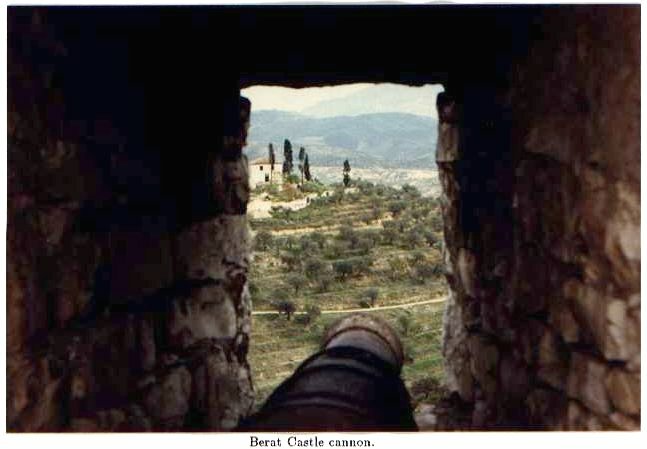 The goats were sent towards the Turks who mistook them for Skanderbeg's forces, while his troops on the hills fought them off. Henceforth the goat became Skanderbeg's emblem. 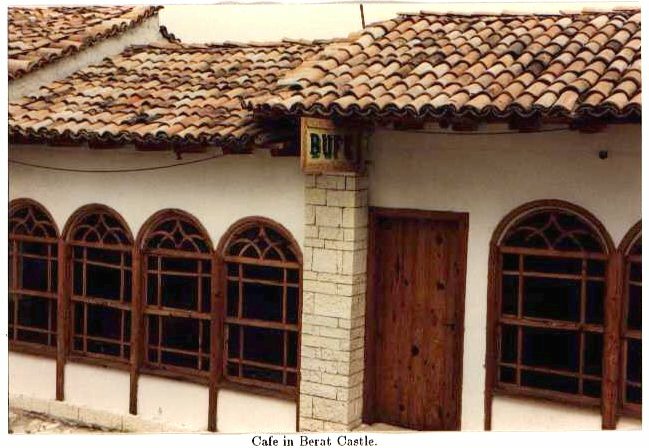 While in Kruzhe we had Turkish Coffee in the recently-built Turkish Coffee House. 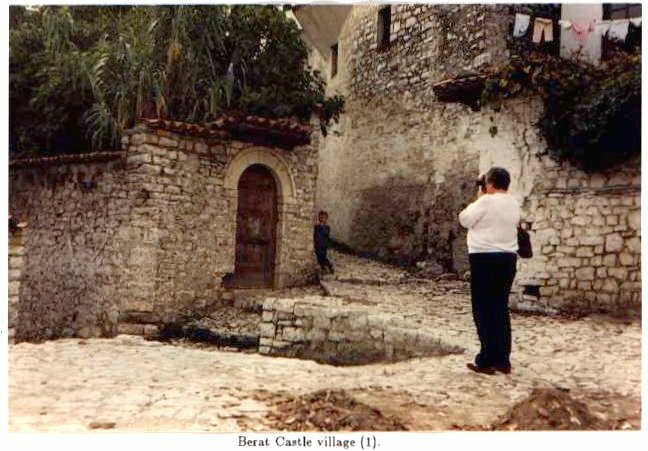 The Albanians having coffee were possibly bemused at the entry of women tourists to their retreat. A visit to the Skanderbeg museum followed, then we made our way back through the streets in dribs and drabs to the two coaches. 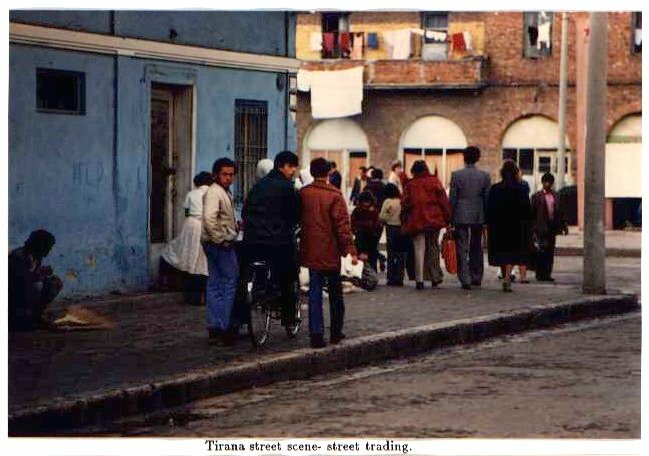 Walking through the towns, which are very plain, is a strange experience; the Albanians had a habit of staring at you as if you had just landed in flying saucer; such was the isolation of the country. There were many men in military green uniform and also policemen in blue uniforms, although you will not see them in my photographs as this was not allowed. The uniforms include soft caps with a red star reminiscent of Chinese uniform. The military men seemed relaxed and were often seen strolling around the shops. 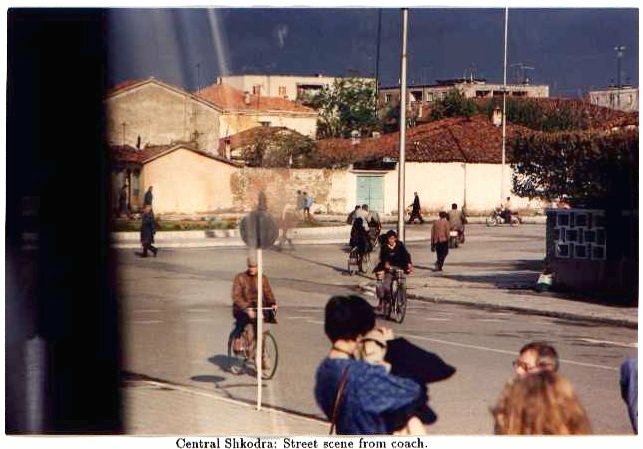 Military service in Albania was compulsory, taking two years after high school; University students spend about 6 months on it added to a further period of physical training. Some children were selected (possibly without much say in the matter?) at an early age for military cadet training. 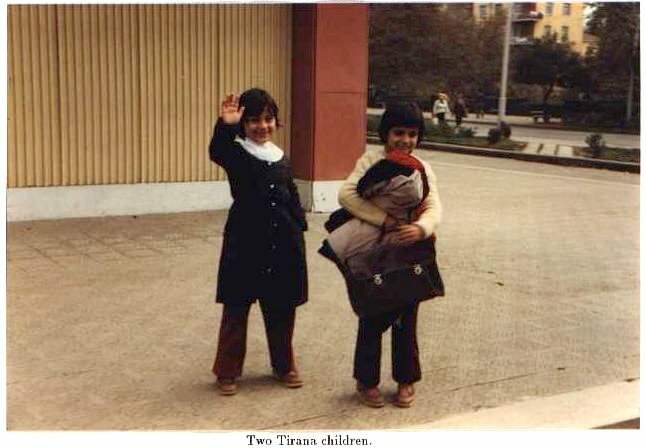 Education was split into three ages, kindergarten (voluntary) from 2 or 3 to 5, junior school from 6 to 16, and those lucky enough to attend the State University of Tirana for a period depending on the subject. 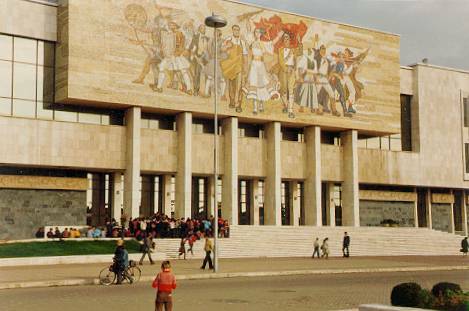 Those foreigners who wish to learn Albanian can apply for a course at the University. The first full day in Albania closed with the drive to Durres (or Durresi) where there is a large complex of beach hotels. We stayed at the Adriatic Hotel which is right on the beach and the best in the complex, and better than the one at Shkodra. The main course at dinner seemed to have been prepared with British people in mind being fish in batter and chips. The late evening provided an opportunity to stroll on the beach. We walked past signs marking out the tourist zone, to view houses which seemed empty, mixed with tourist hotels. There were two pillboxes on the beach, one of which had broken into two parts. There are such pillboxes all over the countryside commanding roads, power lines, bridges, plains, in fact virtually everything. The common small type is about 15 feet in diameter, 5 feet high with a domed top and has an access door at the back and a rectangular port looking menacingly out. Scattered across the countryside many are built up with earth ramparts and some provide elevated grazing for sheep. 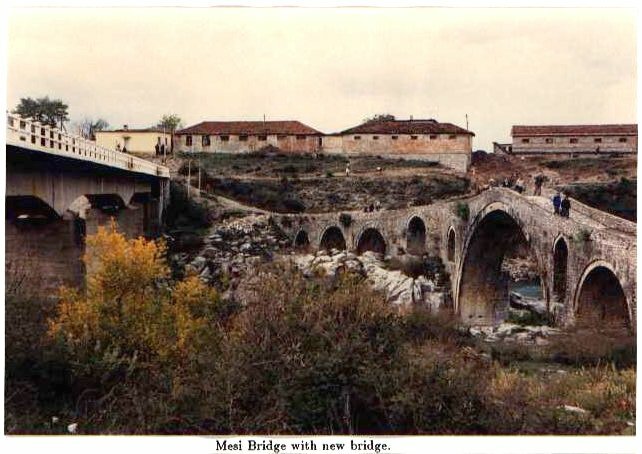 They are said mostly to have been constructed after world war two in the early days of the state so that the people could defend themselves against any invaders, as there have been many foreign occupations in the country's history by for example the Romans, the Visigoths, the Normans, the Byzantines, the Ottomans, the Turks, the Italians under Mussolini then Nazi Germany. Fewer in number are the large pillboxes, 3 or 4 times the size of the common small ones, but often seen with faces in their ports. Some small pillboxes have become dismantled and you can see the metal rails internally on which the dome must swivel. 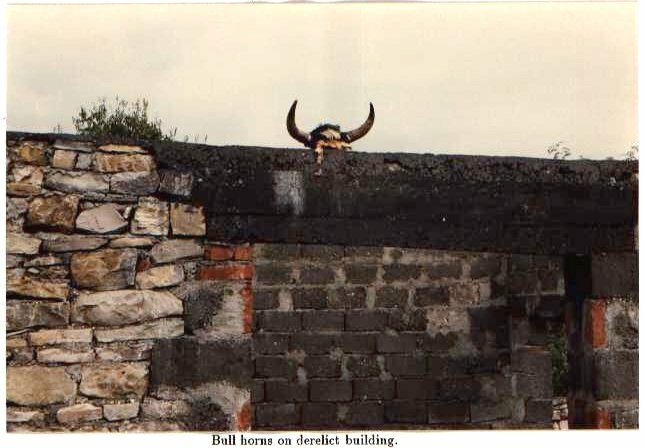 Those present in towns are often bricked up or have been converted to concrete pedestals. 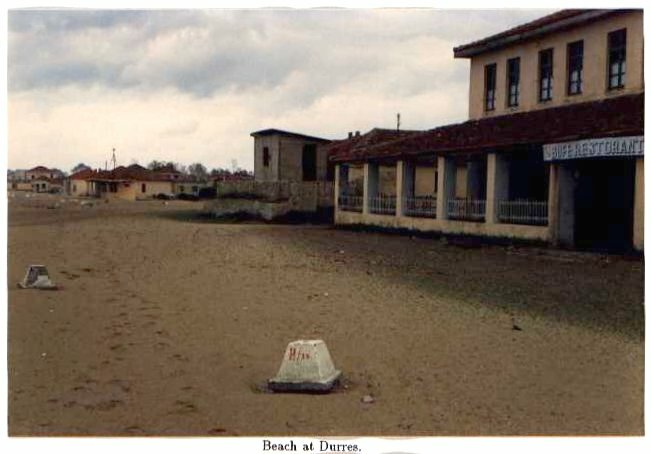 The one intact on Durres beach had been bricked up inside. Near Tirana we saw some giant anti-aircraft guns. 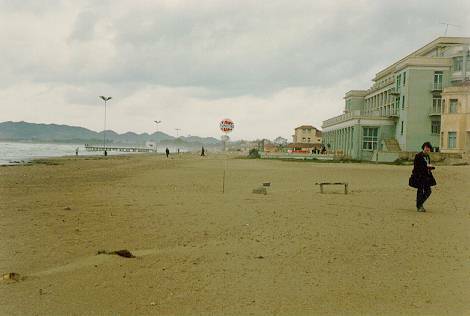 The grey foam on Durres beach testifies to the pollution of the Mediterranean basin; one or two tourists managed to brave the cooling November sea. Few Albanians were seen on the beach but it was early on Sunday morning and late in the season. Albanians get two weeks holiday a year (and work an 8 hour day six days a week). You can see many ships plying the route between Albanian ports along the coast, North of the hotel can be seen a large docks area with many cranes. 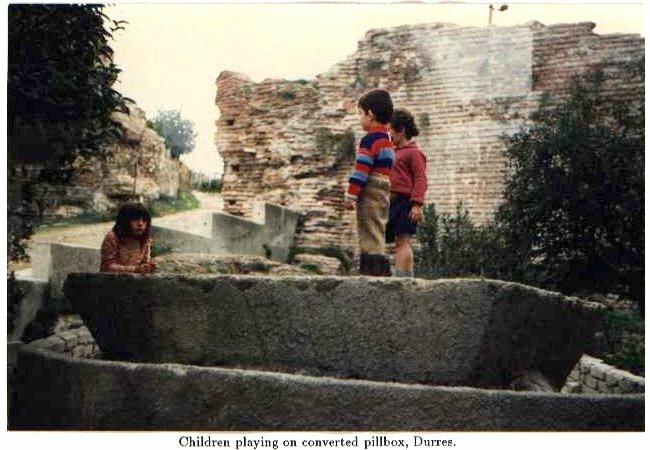 On the second day we drove to the Durres Roman amphitheatre which has been excavated from a hillside near the town. The story is that a peasant was busy digging a channel on the hill, and came across some mosaic. Today the amphitheatre is revealed, with interesting features such as what appears to be the impressively large main entry tunnel to the arena, and ancillary rooms, one of which contains a stairway descending into a dark pit thought to be the lion's den. A unique feature of this is a Christian chapel built into the amphitheatre in the 10th century which contains a fine mosaic of four local martyrs. 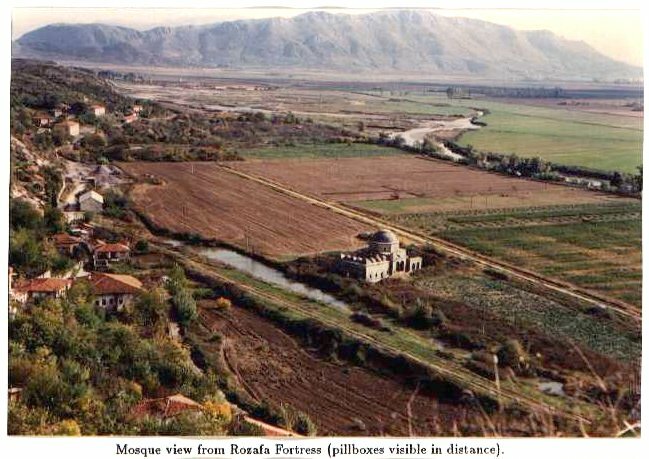 Religion is banned in Albania so those mosques and churches that remain are locked up, preserved as national monuments, or converted to libraries or shops. Houses back onto the amphitheatre site from which are thrown egg-shells and other refuse. 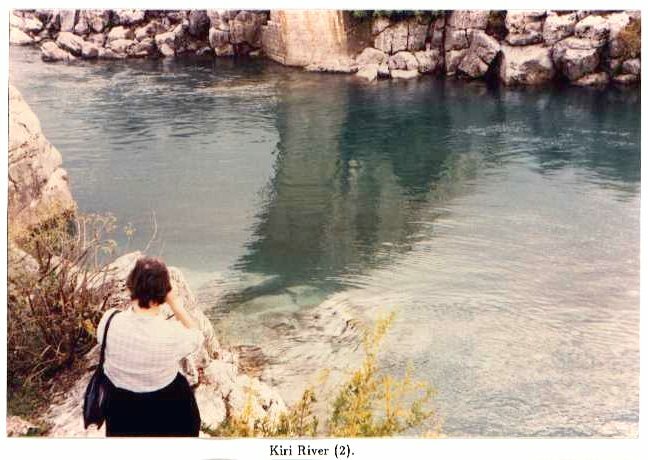 The book "Albania: a Travel Guide" by Philip Ward (1983, ISBN 0-906672-41-4 & ISBN 0-906672-42-2 Pbk) tells us that the amphitheatre was discovered in 1660 beneath a curiously shaped hill. Seventy houses were demolished, revealing an ellipse 120m across its widest part. 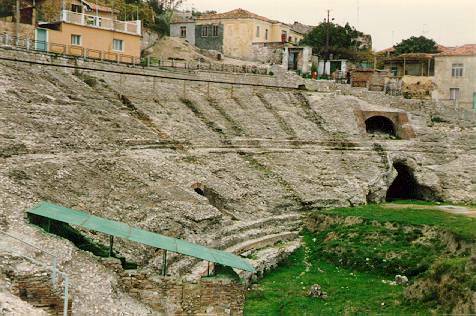 Ward says that the apmphitheatre seems to have been cut out of the hill in the 2nd century, and seated about 20000. It was abandoned in the Middle Ages. 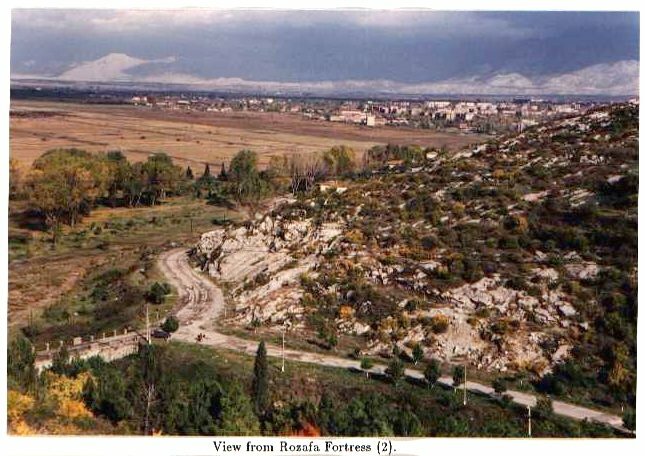 The ancient Roman Dyrrachium apparently lies beneath the town of Durres, leading the authorities to declare the whole town a national archaeological site where no digging can be done without prior authorisation. The Archaeological museum in Durres is supposed to contain thousands of relics from the locality, where many finds have been made (Durres being located on the site of a Roman town), but we were shown a meagre few cabinets of relics including samples of Greek vases with fine pictorial decoration. 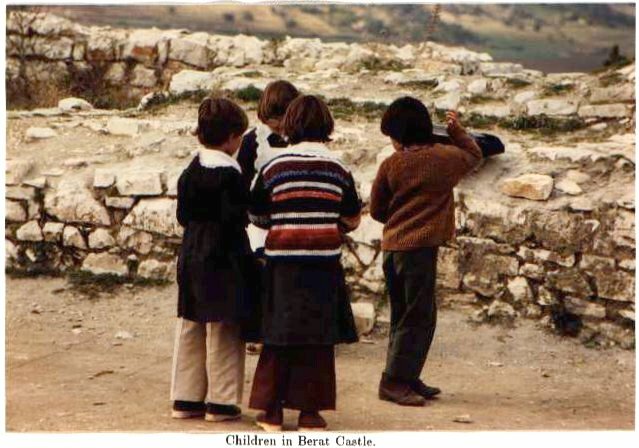 In the courtyard were kept larger stone relics, and we were closely followed by a group of Albanian schoolchildren who seemed more interested in us than the relics. 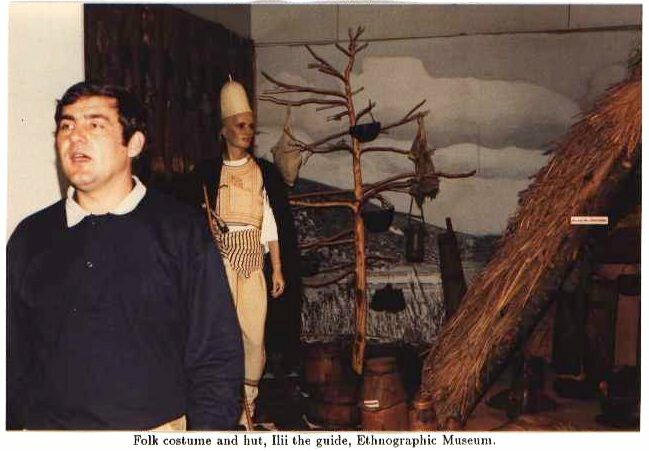 Philip Ward also describes the Archaeological and Ethnographical Museum as a two storey building with a basement; containing an Illyrian helmet, Illyrian inscriptions, a 6th century "krater" from the necropolis, Apulian red-figure vases, sculptured heads, in the basement unsorted sherds and funerary urns, and in the courtyard, a jumble of lead pipes, weatherbeaten sculptures, amphorae, an Osmanli gravestone, and a stack of cannonballs adjoining a reconstructed forum. 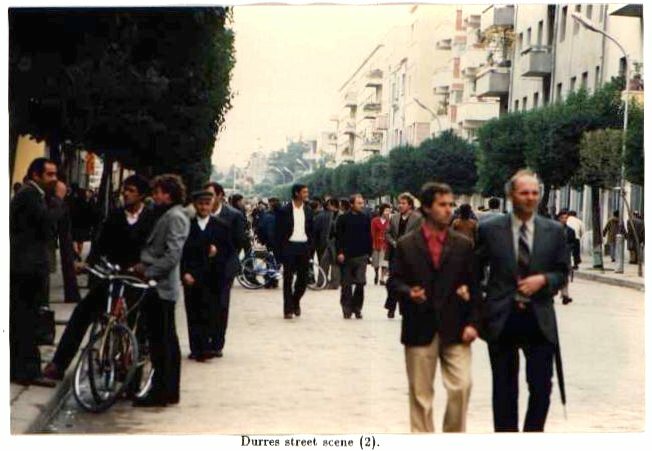 Having concluded our visit to Durres, we went on our way to the capital Tirana. 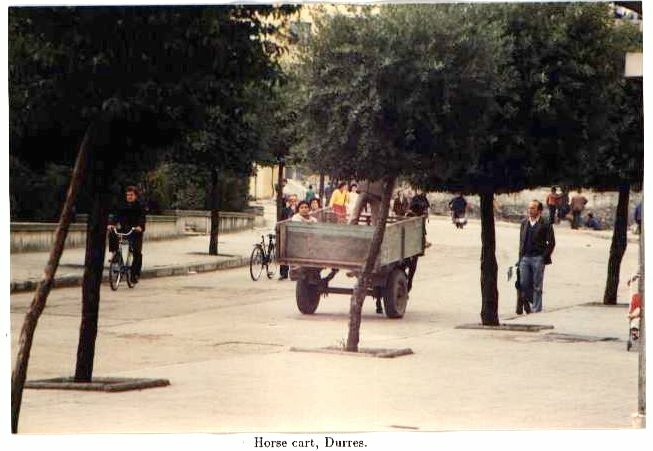 This was at what seemed a breakneck speed (30-40 mph) dodging cyclists and lumbering diesel trucks, horse carts and peasant women carrying baskets on their heads. Each were passed by hooting (Albturist coaches have two horns, one two-tone for long hoots and a lesser horn for parping) and swerving around. Sometimes on passing a truck our driver would wind down the window and have a chat with the other driver, or shout boisterously. 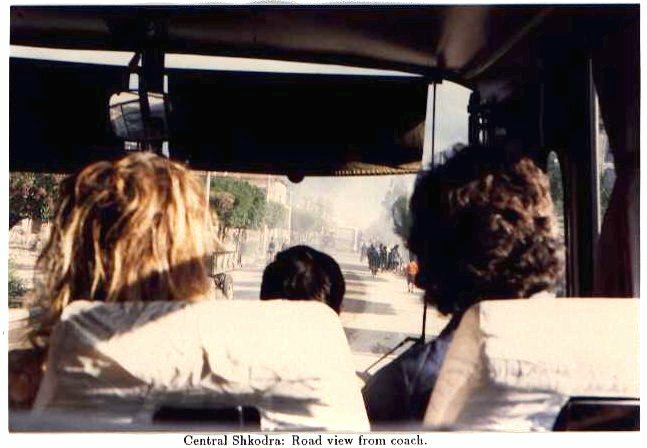 The combination of coach driving style and much walking resulted in troubled backs. 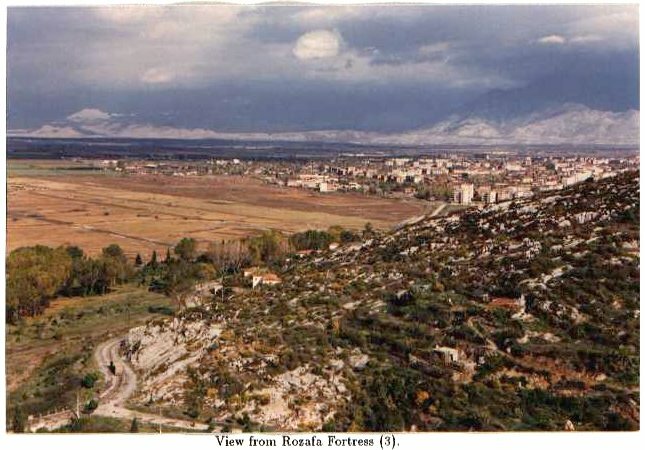 On the approach to Tirana we passed through several state farms although you could not really tell any difference between them. Agriculture is organised into either State farms, which are fully collectivised and workers have standardised conditions while the State takes the profits; and co-operatives where rewards are dependent on the workers' performance. The Albturist hotel in Tirana is the tallest building with 12 residential floors; hence it supports two microwave relay dishes on the roof. It is superior to any others we saw but still follows a basic simplicity. Rooms in the capital's No. 1 hotel were GBP 45 a night for a double room. Our room lacked a loo seat but at least the flush worked and the water was hot. 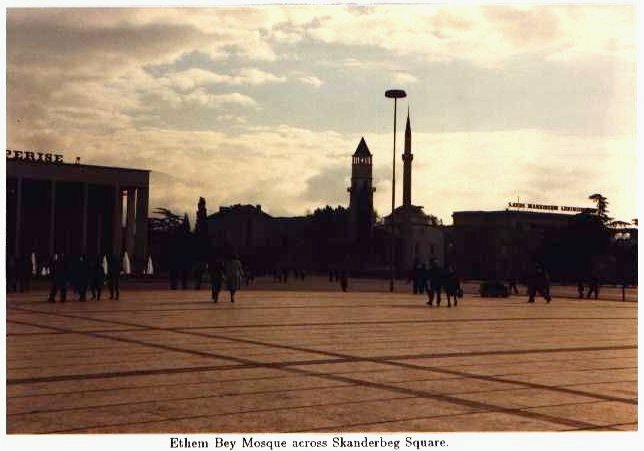 The room had a grand view of the central square named after Skanderbeg. 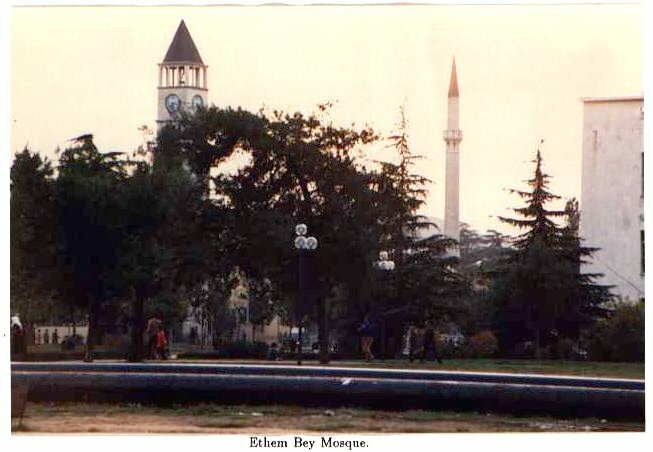 In contrast to the monolithic blocks of buildings (Palace of Culture, National History Museum, State Bank) the Ethem Bey Mosque (closed) and spire, reconstructed after war damage, contributes to the Tirana skyline, and the Martyrs' cemetary is visible in the distant hills. 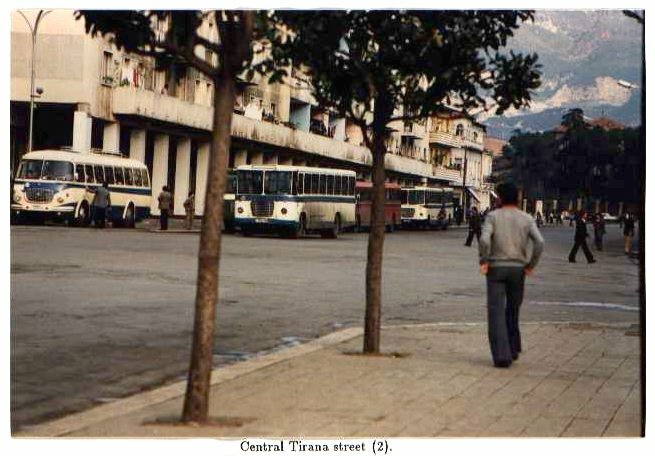 The square and roads of Tirana are like the other towns in that ears accustomed to the noise of London are confronted with nothing but the infrequent passage of few vehicles and buses and the muted hum of conversation. We were able to explore one of the main streets radiating from the square before visiting the National Historical Museum. Near the far end, we found a market and some old women in black sitting on the pavement, selling small bundles of vegetables. In Tirana I saw the only two female militia seen during the trip. 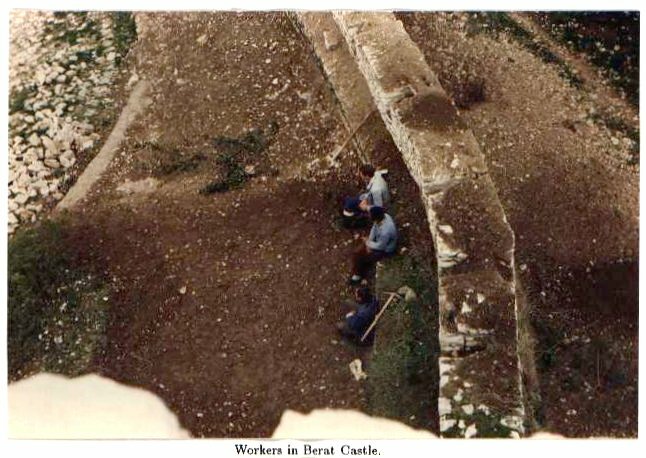 Men are allocated to the heaviest work such as mining, while toiling in the fields is considered to be light work suitable for women. Even children of all ages work a few hours a week in the fields, or in factories, our guide informed us that this is done so that each citizen learns to love work of every kind. When walking in the streets, children sometimes come up to you asking for biros, or "stylos" meaning the same thing, or chewing gum. 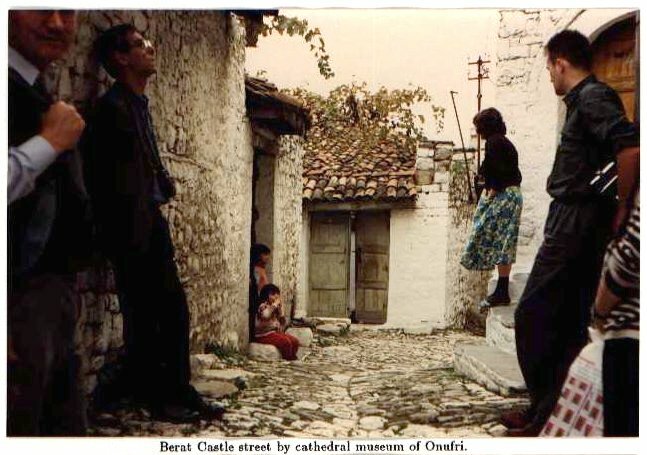 One in Berat asked if I was English. 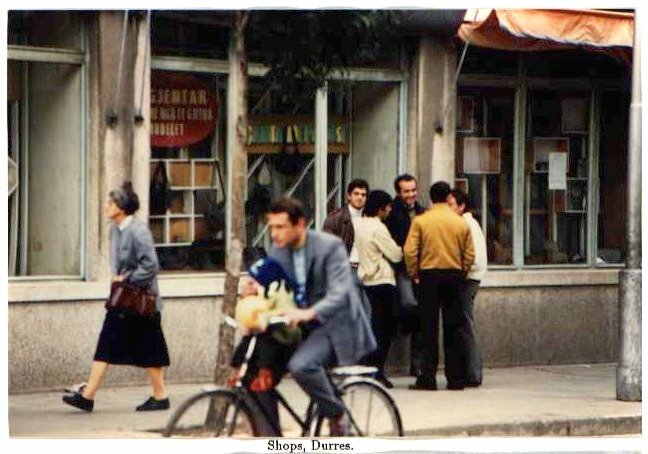 Many Albanians speak English because it was being taught in schools there as an international language. Before dinner, which was marginally better than elsewhere, we had the option of attending a concert in the Palace of Culture. 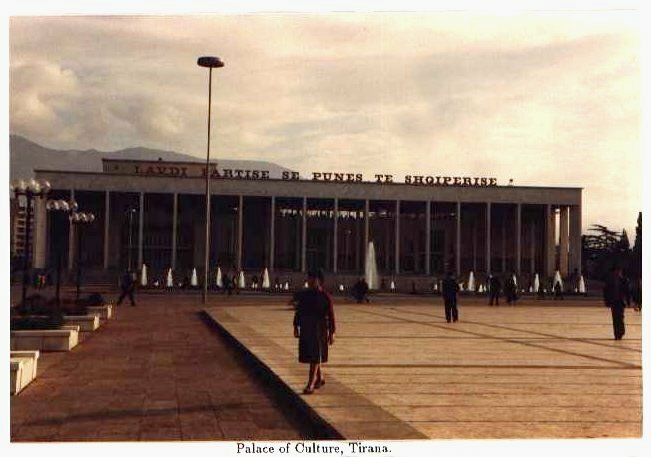 The auditorium consisted of a room with a grand piano and three rows of armchairs circled closely round the stage, and we tourists were given the front row while Albanians were ushered into the back rows which made us feel guilty. The soprano Inva Mula performed magnificently with music including Albanian composers, Verdi, Brahms and Liszt. An astounding performance on the piano came from a student pianist Etrita Ibrahimi wearing knee socks. After dinner we had another free period to just wander around the streets, like most Albanians do in the evening. With soldiers and police everywhere, you get the impression that the State is firmly in control of the streets. On some street corners small black-edged posters can be seen stuck to the walls. These pay tribute to the dead in a state that prohibits all religious expression. Some people in the travel group came across an Albanian state wedding and were welcomed in to the reception. Outside, they met some old men who described how they would love to come to England, because in their country they are not free. Others walked the broad avenue to the University. 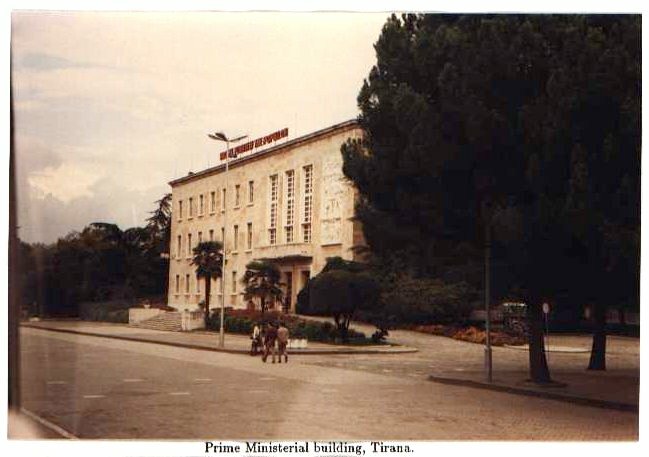 At government buildings such as the prime ministerial building, Palace of Congresses and foreign embassies, they were gestured off the pavement to pass by in the road by the guards. The University accommodation is a version of the drab concrete apartment blocks and many windows lack glass. The Cuban embassy however is not on this avenue but nestles in an ordinary street off the square. On its wall is a propaganda display which apparently for reasons unknown attracted crowds in the daylight hours. 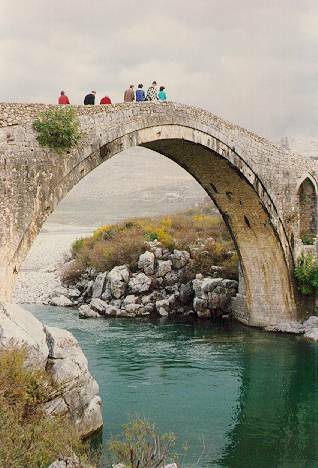 The next day, due to a lucky change in return air scheduling, provided an extra day's optional trip south to Berat. 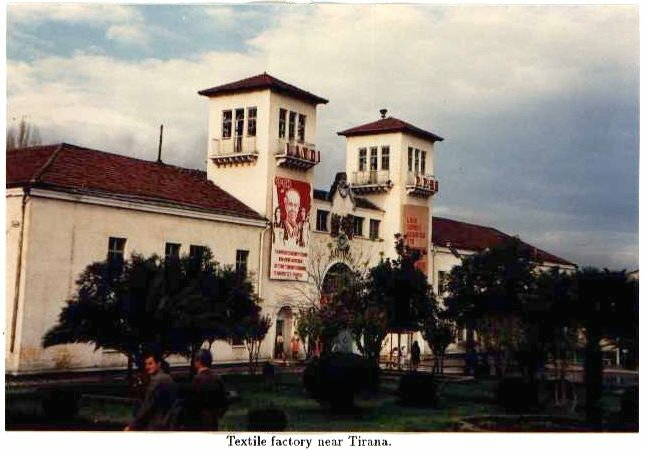 We drove out of Tirana past industrial sites. 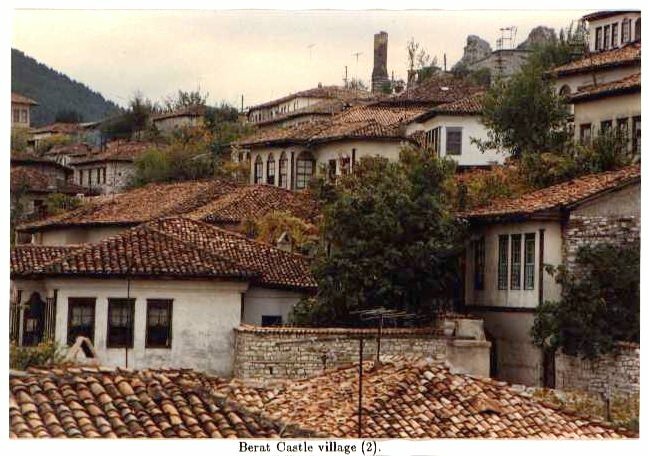 The houses in Berat are old and have such a large area of windows that the town is called the town of 1000 windows. People could easily sign messages from one house to another through the windows of the closely spaced houses. The town was designated by the state as a museum city and well maintained. 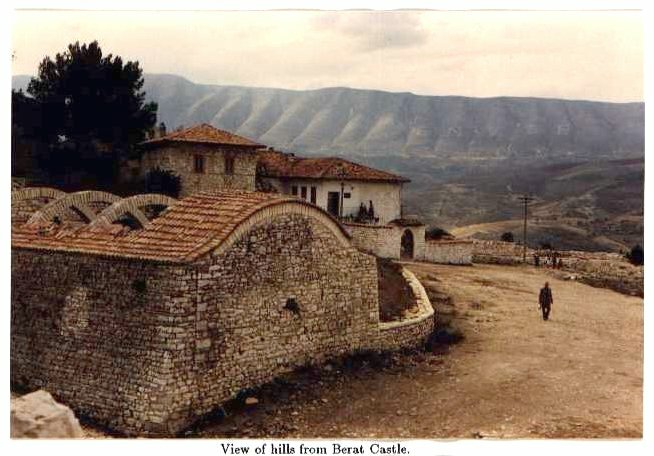 Up on the hill is the castle of Berat, which holds within its walls a community of narrow winding streets inhabited since long ago in the old tradition. Our visit took us to a Byzantine church of St. Michael, containing icons and religious paintings and relics. 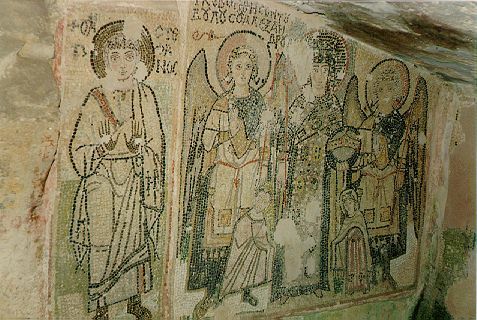 The Museum of Onufri there is a cathedral, containing complex ancient wooden carving preserved by varnish in an excellent condition, but little remains of the ceiling frescoes which were severely damaged by whitewashing. Much ancient artwork has been lost by the destruction of religious buildings for building materials under the state's past anti-religious dogma. Nowadays they try to preserve the remaining buildings while proscribing religion, and put them on show for tourists. The journey to Berat took us through a plain which was formerly swamp land where the inhabitants suffered badly from malaria but we were reassured to hear that the swamplands have all been drained and cultivated eradicating the malaria problem. 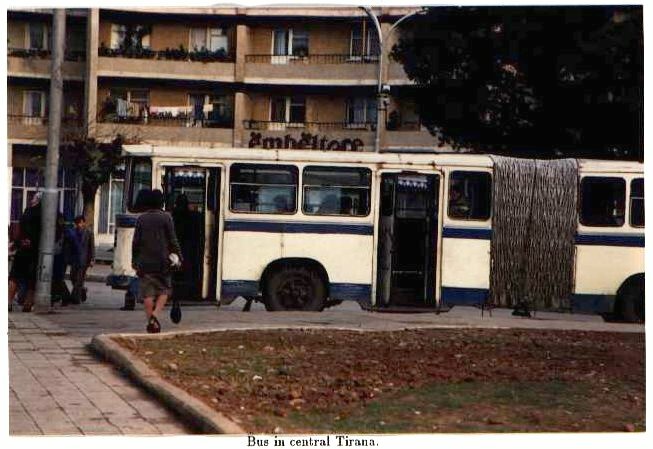 We returned to Tirana for dinner and the following day was spent in the capital. 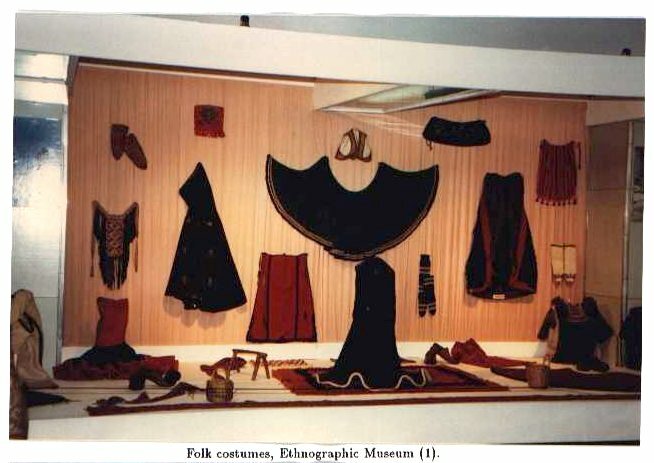 We visited the Ethnographic Museum which contained many different examples of folk costumes from different parts of the country and different periods, and traditional machines for weaving, dairy product making, milling and making gunpowder. 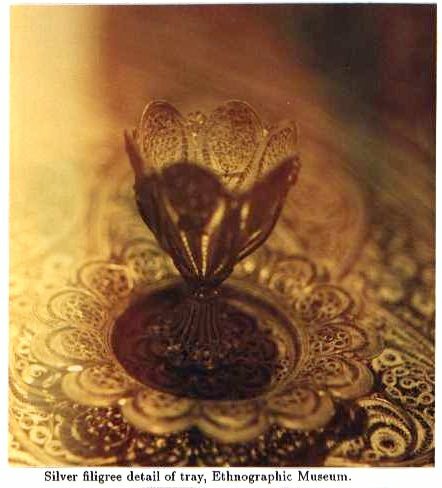 There are examples of filigree and wood carving, modern day samples of which make good souvenirs. Next, our coaches took us out of the centre of town past embassies, the drab prime ministerial building, the new elaborate Palace of Congresses and the University, up the hill to the Martyr's cemetary. 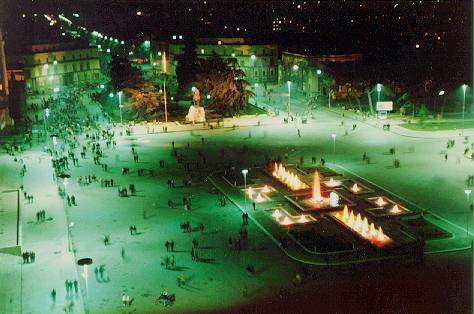 This is illuminated at night and is clearly visible from the Tirana Hotel. 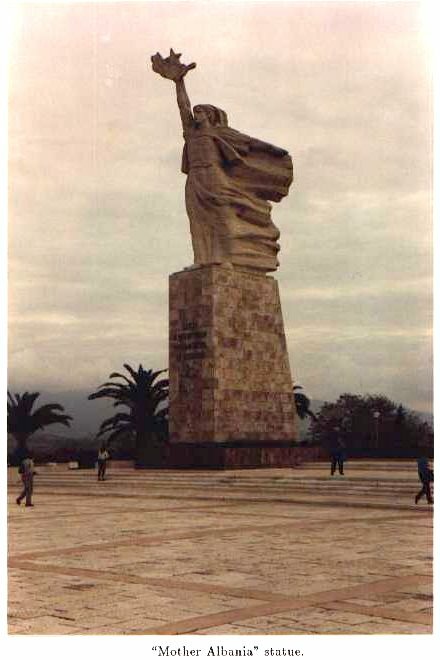 The Martyr's cemetary features a large and magnificent statue of a woman with flowing robes, symbolising "Mother Albania", an image that is repeated on posters throughout the country. 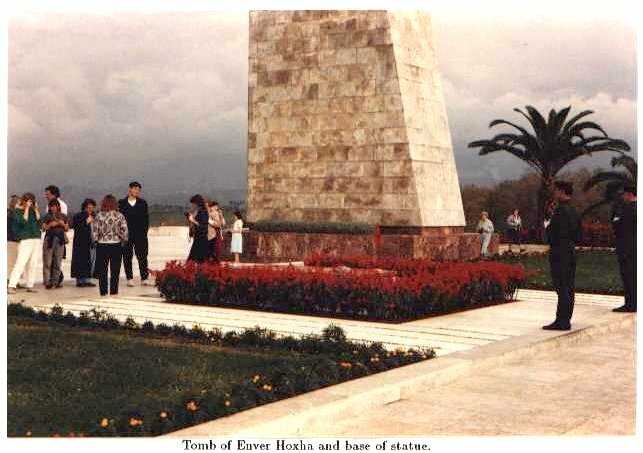 Next to the statue lies the tomb of Enver Hoxha. The two soldiers standing guard over the tomb are the only ones that were permitted to be photographed. A few other major figures have graves nearby, and arrayed in terraces down the slope lie many heroes and martyrs of world war two. 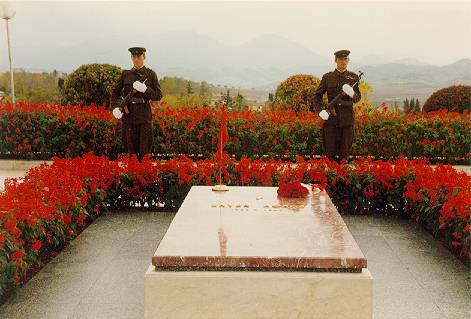 There is a curious symbolism of a star and a golden leaf on the marble slabs to indicate whether the grave is of a hero and a martyr, or "just a martyr". 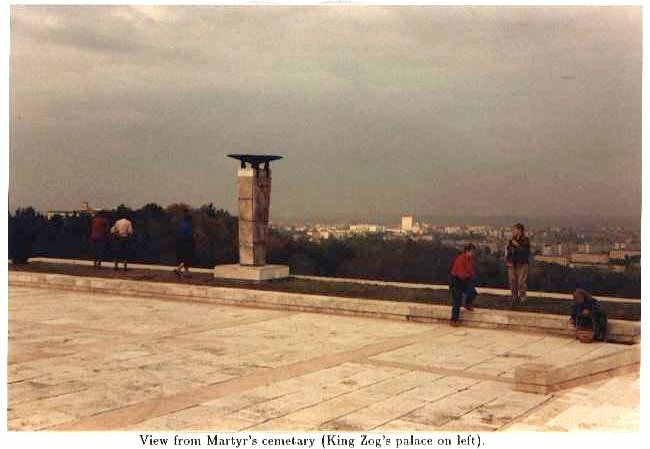 From the martyrs cemetary it is possible to see the roof of the old palace of King Zog in its grounds, nowadays used for receiving foreign dignitaries, such as the Greek Foreign Minister who was visiting during our stay, with some or all of his group staying in the Tirana Hotel. 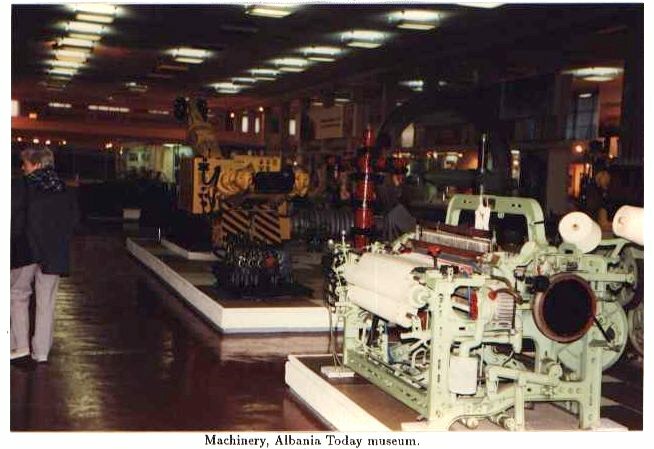 Back in central Tirana, we visited the Albania Today exhibition, largely of industrial products and machine tools and reminiscent of early post world war two Britain, according to the elders of our group. Mineral such as Naphtha, oil, nickel-iron, sulphur, chromium ores, copper ores are proudly displayed as natural resources. Chromium ore is abundant in Albania and Albania has been a major producer and exporter (as ore, concentrate, and carbonic ferro-chromium). 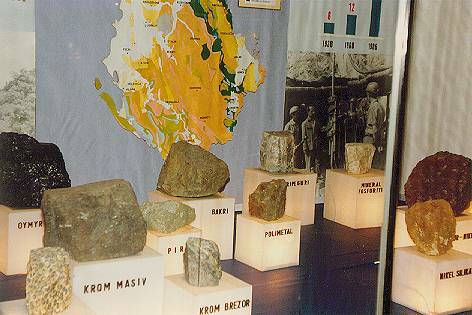 In October 1996, an international tender for part privatisation of the Albkrom mining company was won by the German company Preussag. 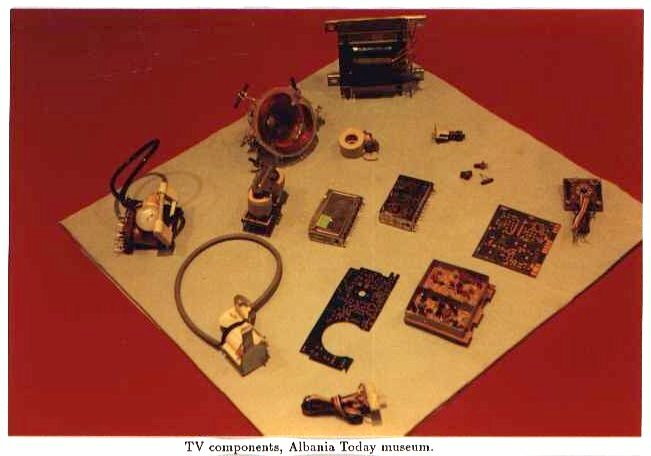 Some technological products seemed to be masquerading as Albanian produced whereas it was quite obvious that the microcomputer on display is an IBM PC with an Albanian label, and although spare parts are produced for TV and radio, most TVs were probably imported and relabelled. Black and white TVs were supposed to be produced locally but we were told colour TVs are all imported. Audio amplifiers were on show which use valve technology. Small transistor radios resembled those of 20 years ago. During our visit, there was a cloudburst and inside the museum, large pools of water spread in numerous puddles on the floor. 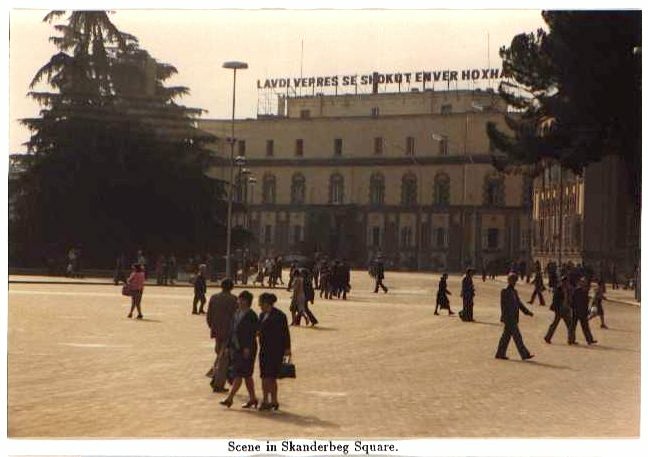 Before leaving the capital, we had to post any literature printed in Albania back to our homes at the post office (or post it in Shkodra on the last day), as the Yugoslavians did not permit Albanian publications to enter their country. 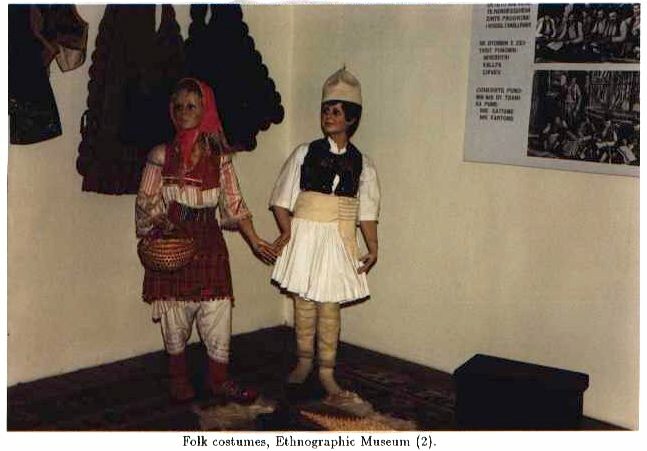 The Albanians on the other hand did not allow publications about Albania such as travel guide books printed outside their country in, but you could leave such items at the border post and get them back when you leave the country. 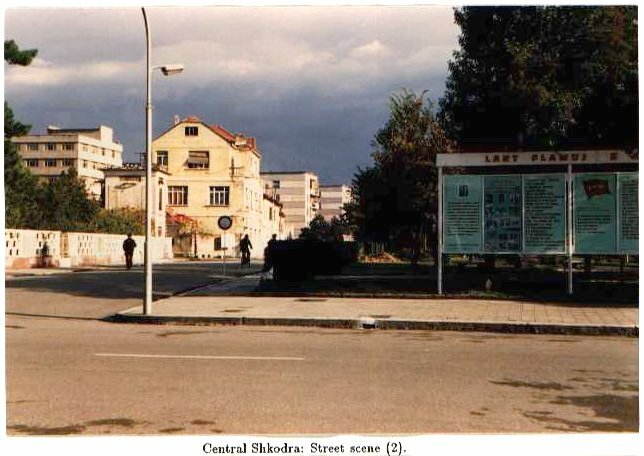 Finally, we returned to Shkodra where we wandered around the streets for a little while, then had dinner in the hotel, and later tourists danced a reel to Albanian folk musicians. The musicians in the hotels all seem to know a selection of Beatles songs and Glen Miller. 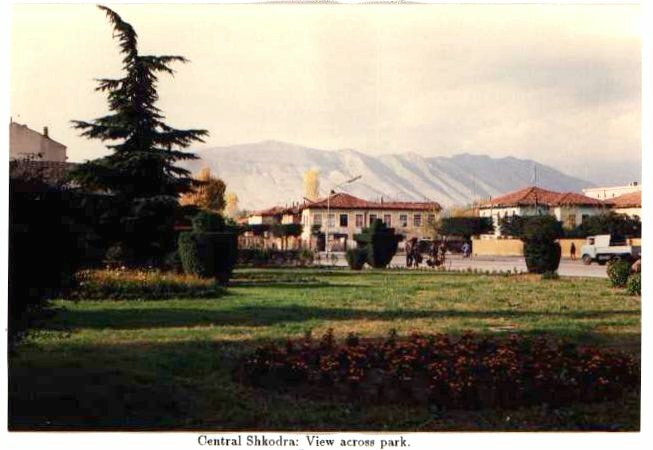 At Shkodra we were treated to a rendition of the "Birdy song". Our coach driver and a tourist gave a display of Greek dancing. 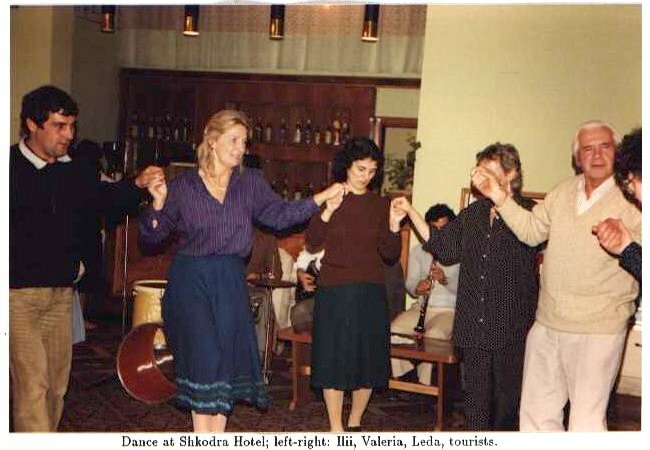 Dance at Shkodra Hotel; left-right: Ilii, Valeria, Leda, tourists. The national alcoholic spirits are Raki, a distillate of their oily white wine and Punch, which is derived from oranges and has a powerful orange taste. This was actually rather good (or so I thought at the time). Local beer mostly seemed to resemble real ale; Tuborg was also available. The red wine proved to be quite pleasant. 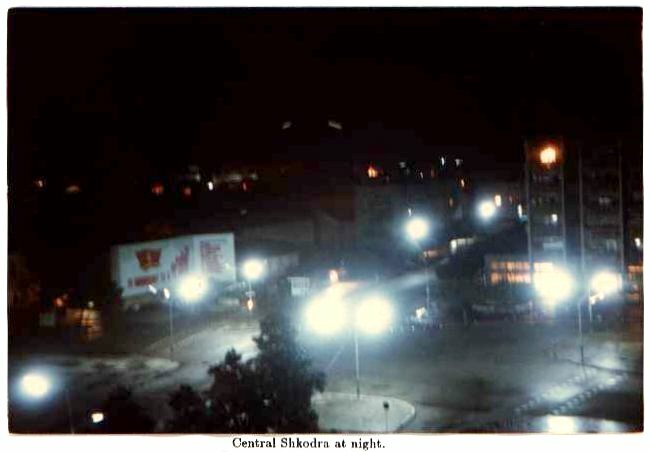 We had to get up at 3 a.m. in Shkodra to set out for the return flight from Titograd, but spending as little time as possible in the cockroach infested room was a relief. We were given packed breakfasts of bread, cheese, beef and boiled egg (simple but good) then left for the border. The customs process again involved declaring all items mentioned in the list and radios were once again checked. 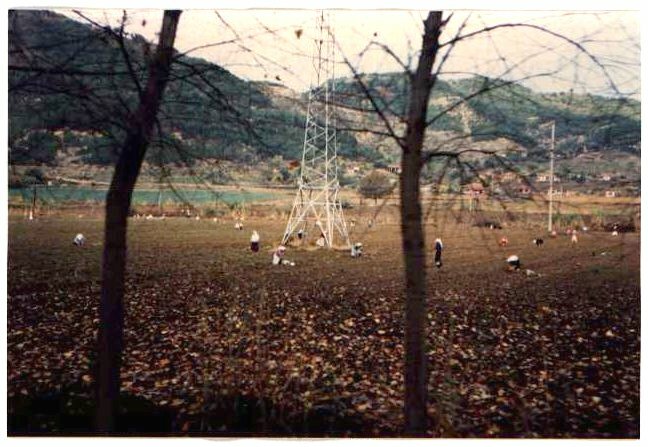 Then we crossed the no-mans-land again in darkness to Yugoslavia and waited for passport clearance. After driving to Titograd where a particularly sensitive body scanner was set off by my keys and penknife, and similar items possessed by several other people had the same effect, we took the internal flight to Belgrade. During check-in the baggage X-ray machine must have portrayed a suspicious picture out of the arrangement of copper trays and cups in my souvenier Turkish coffee set, my spare battery packs, camera, telescope and telephoto lens because I was directed to follow a Yugoslav security officer with my baggage to a small room after having my name read out from my passport over the intercom. The officer was quickly satisfied by his search of my baggage, and was not particularly interested in my hand luggage although I showed its contents, and did not search me or my coat pockets. Meanwhile other members of our group were alerting the tour leaders but I was soon enough back to the baggage check-in. Then I lost my boarding card but found that I had dropped it into my luggage. 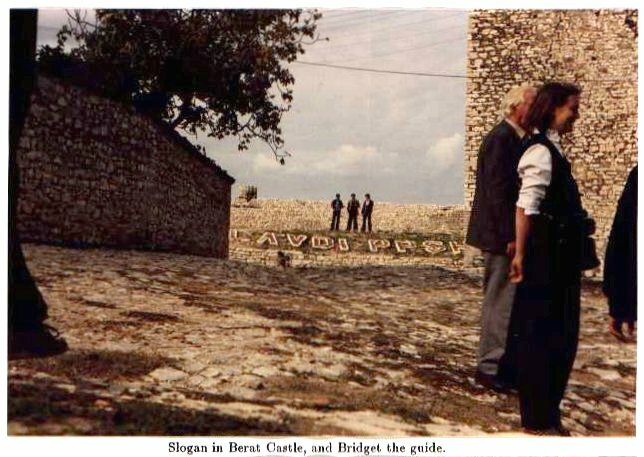 Before we parted with the Albanian guides, one tourist handed over some presents to the guide and the coach driver which had been purchased by a whip-round in the coach. 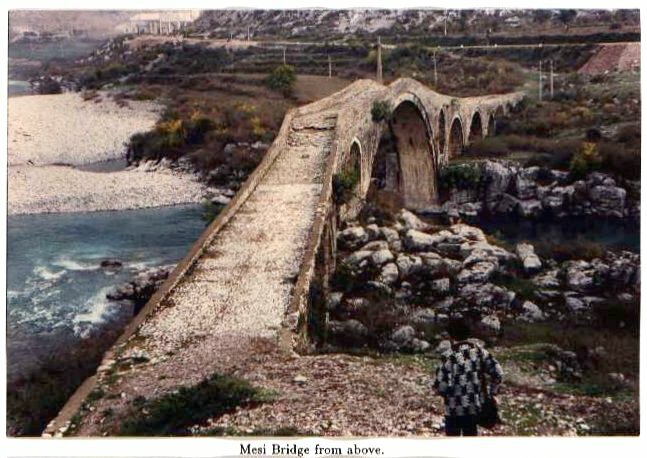 We had been told not to tip with money, but we could give presents provided it was on the coach travelling from Shkodra to the border. Our guides thanked us and invited us to come back any time, saying that countries cannot meet, but people can. 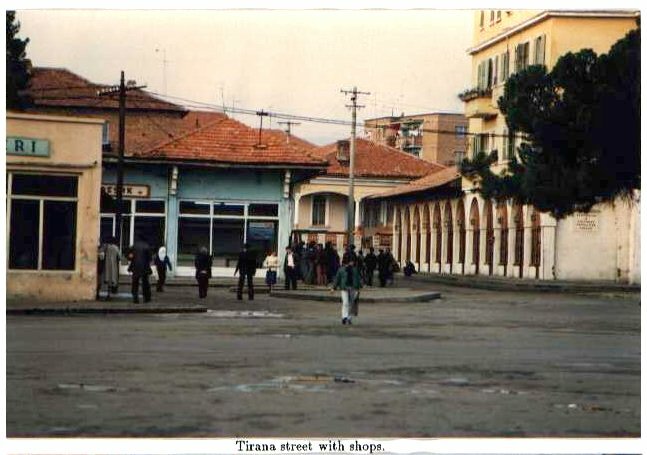 From history to current timetables, information about HSH Albanian Railways. 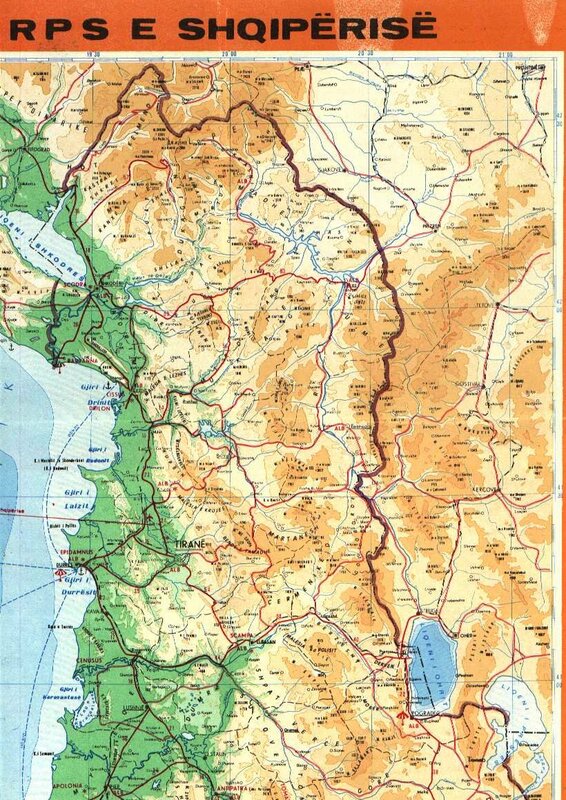 A collection of Albanian area maps from the Perry-Castañeda Library Map Collection at The University of Texas at Austin. Copyright © 1987-1997, 2006 - C. J. Seymour. All rights reserved. No portion of this site may be reproduced in any way without express permission of the publisher.